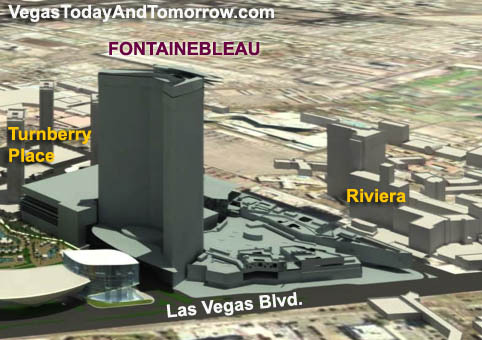 Latest News 9/29/10 It looks as though Carl Icahn is getting ready to unload the Fontainebleau, according to a report in the New York Post. 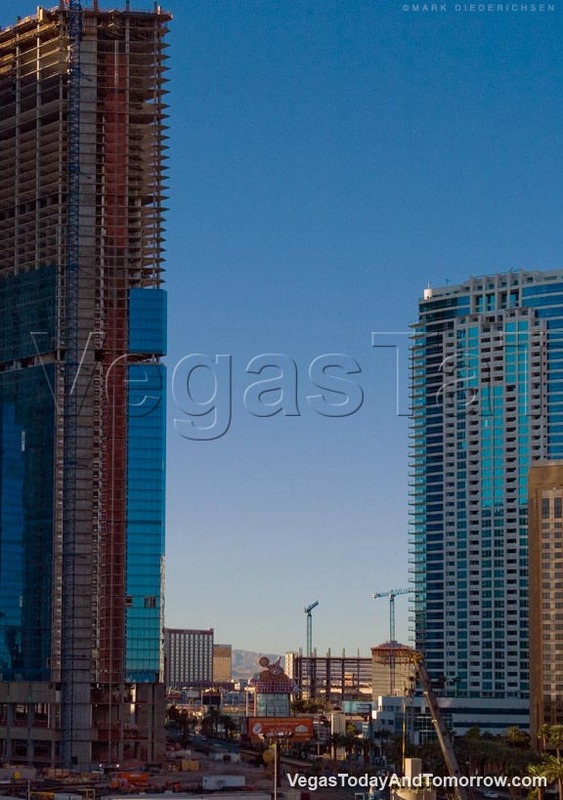 He's selling everything that's not welded in place. 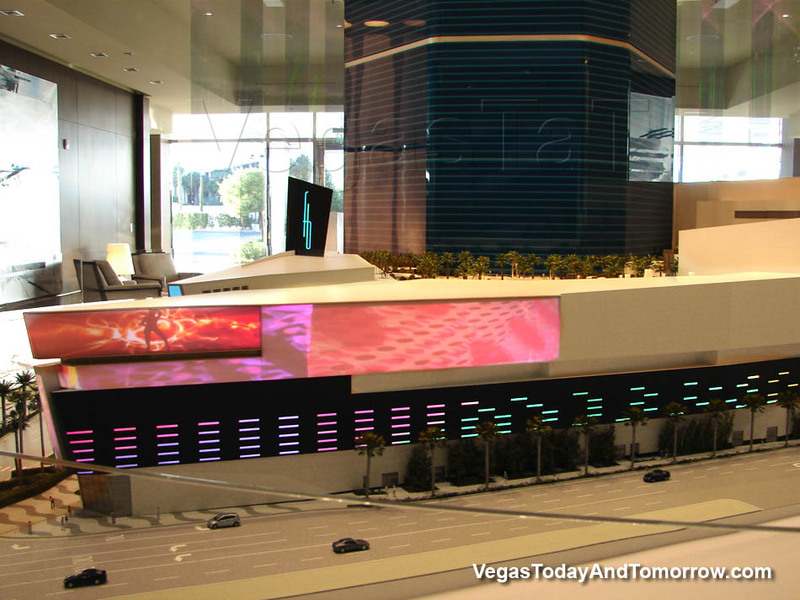 Beds, furniture, etc. 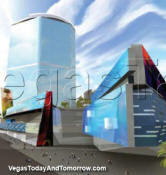 are being sold. 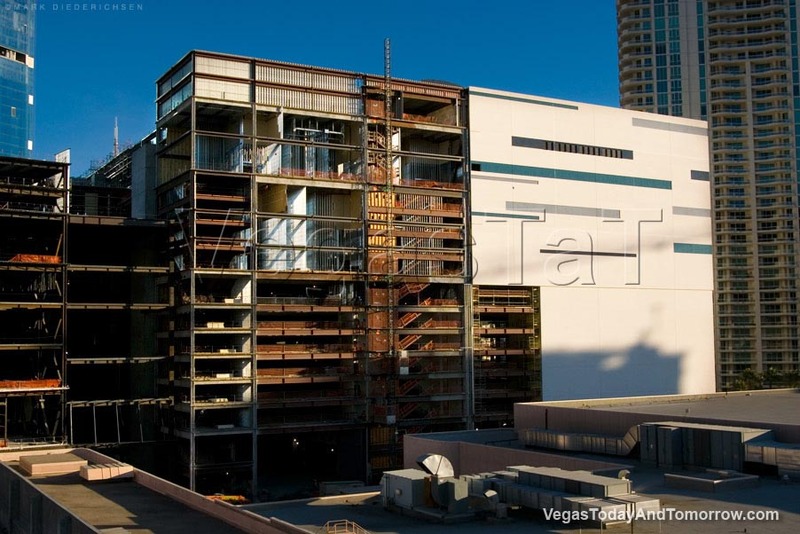 This seems like a strategy to get as much as possible out of the place before it's sold to another developer. 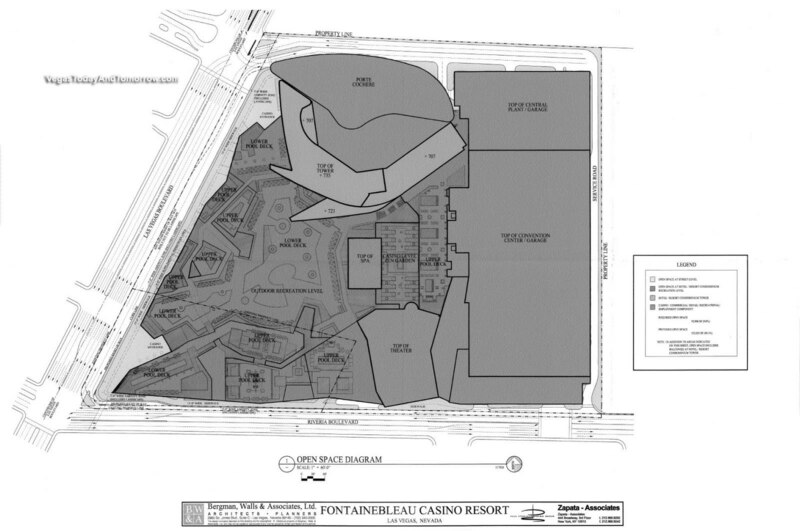 Icahn is reported to have said that he has no plans in sight for the completion of the resort. 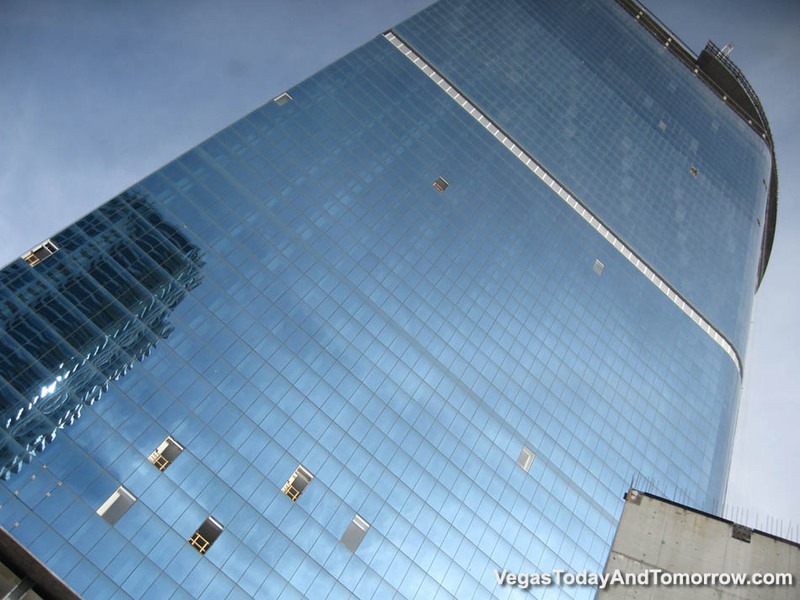 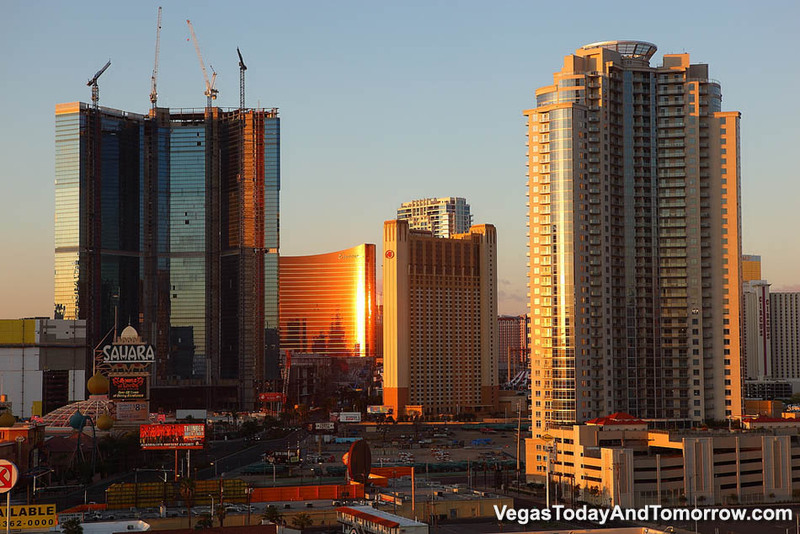 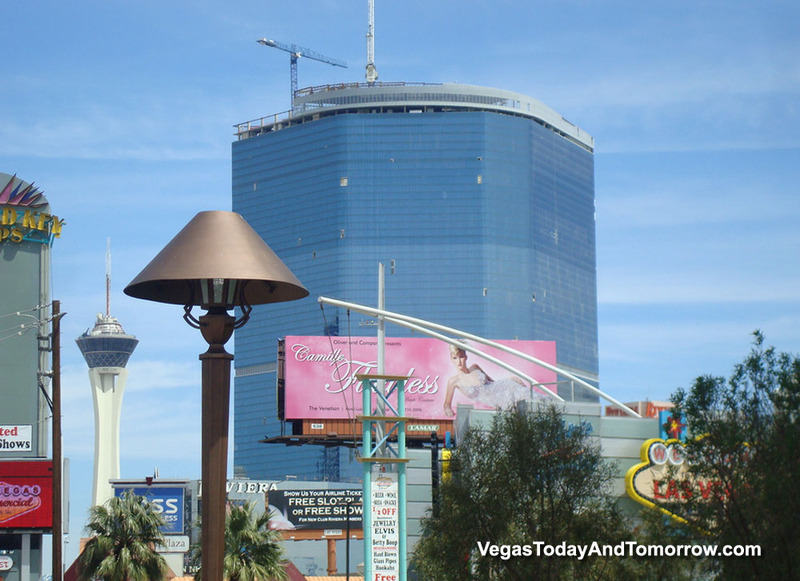 Can the depressed Vegas hotel market handle another 4,000 rooms anytime soon? 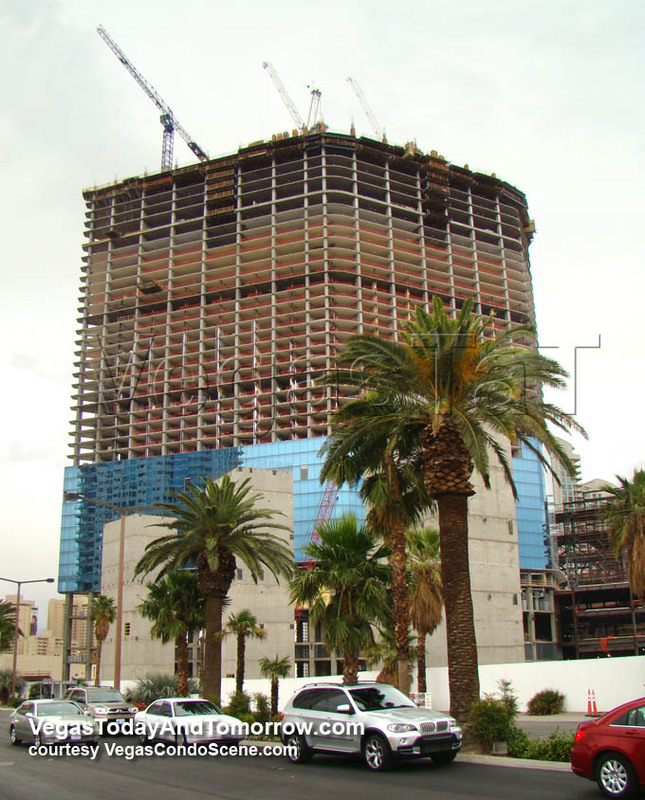 - I think not. 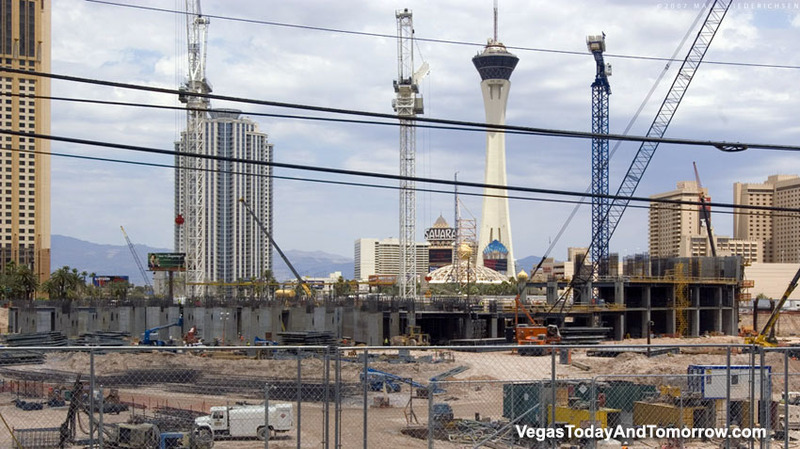 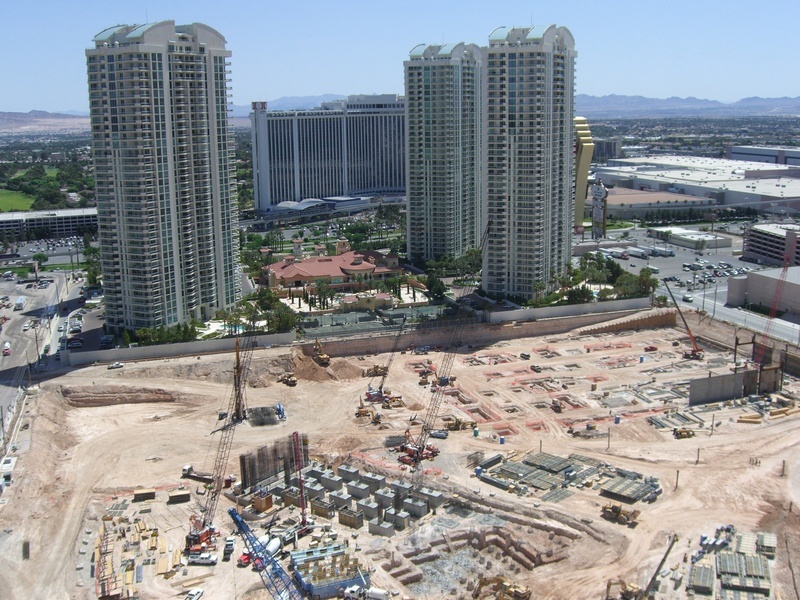 $2.9-billion development being built on the Strip (just north of the Riviera) on the 24.5 acres where the El Rancho and Algiers casinos once stood. 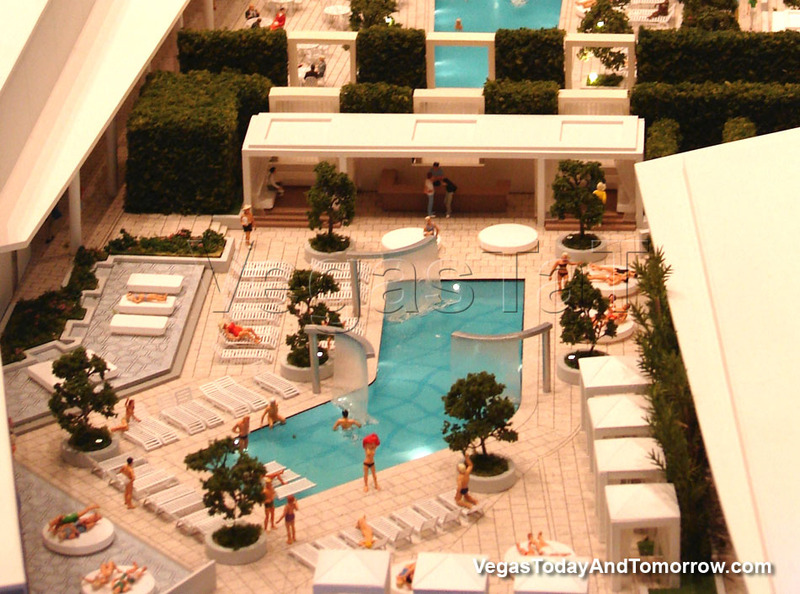 The seven-acre pool deck, floating 72-feet above the Las Vegas Strip, is designed as an 18-hour-a-day experience and the ultimate in adult playgrounds. 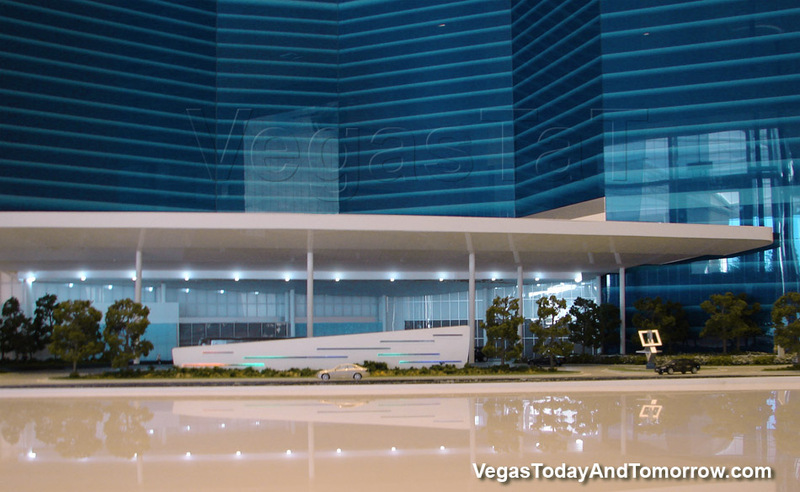 Called Cloud 9, it includes five pools, three spas, three restaurants, a nightclub and ultra lounge, cabanas, and an open-air casino. 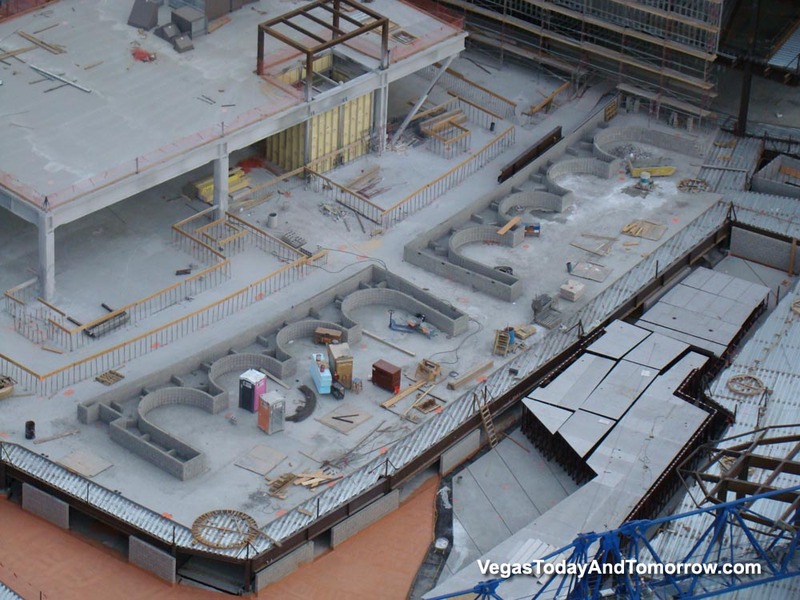 and the pool deck above. 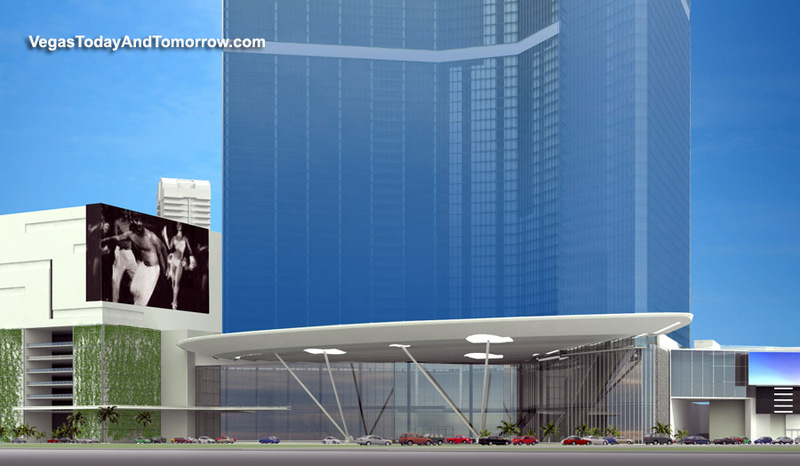 If you enjoy this video, please visit its page at YouTube and rate it. 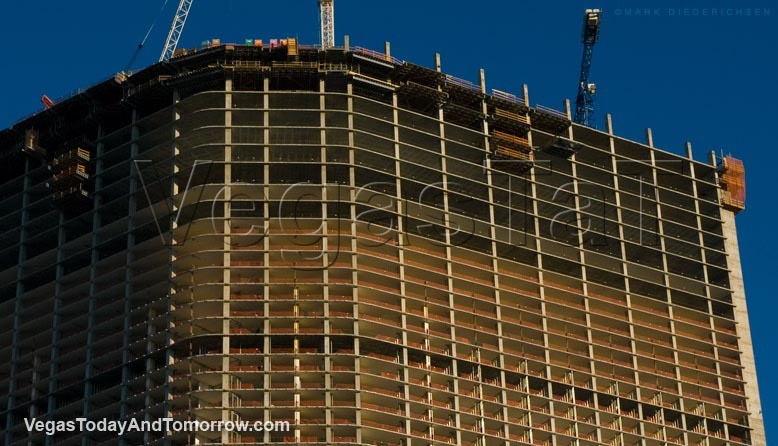 You can leave a comment there as well. 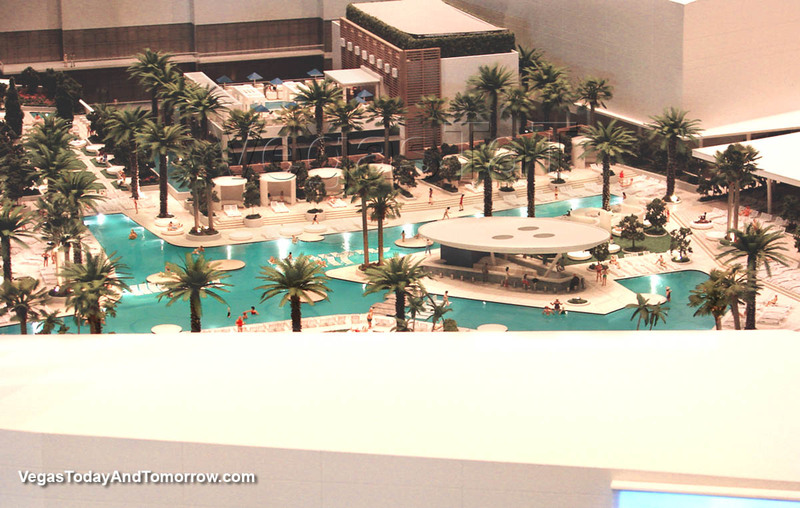 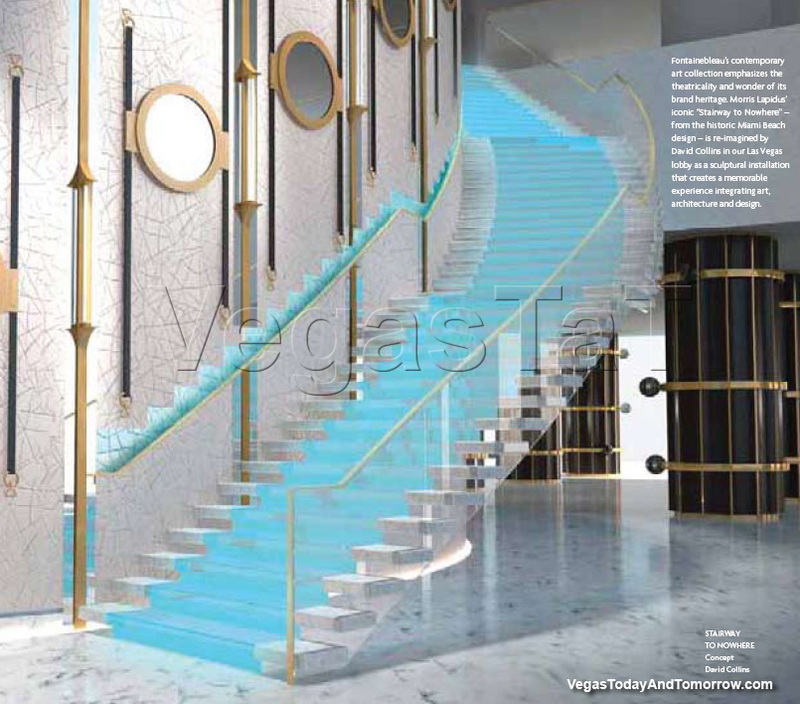 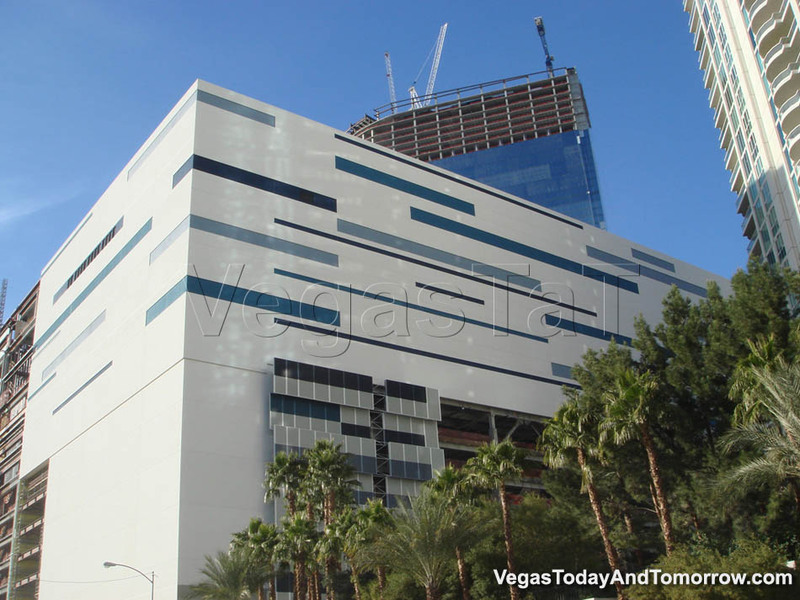 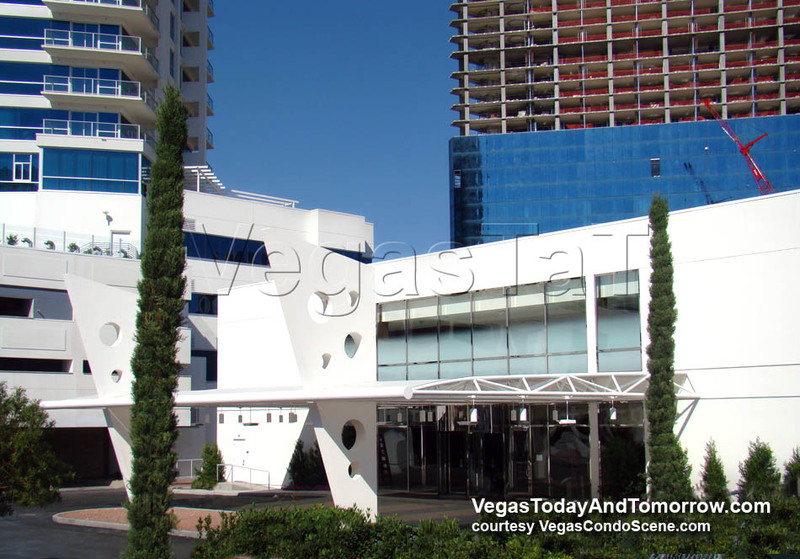 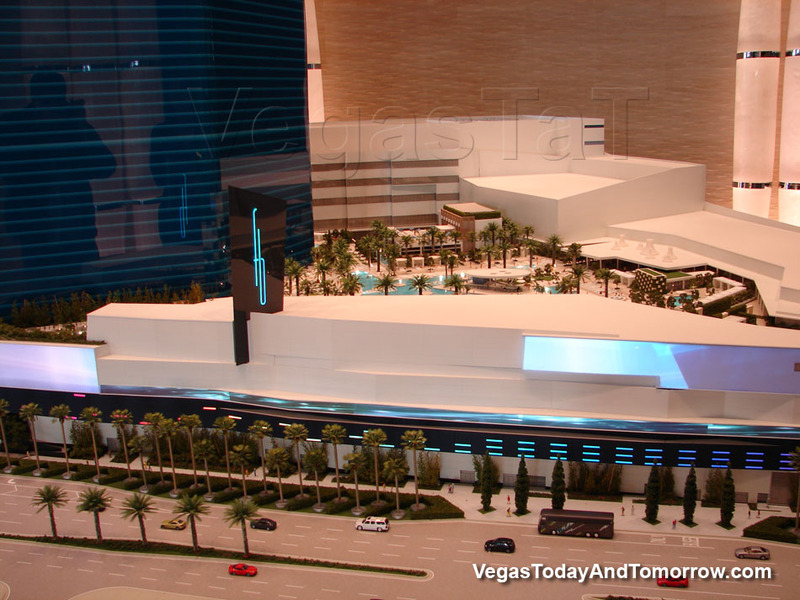 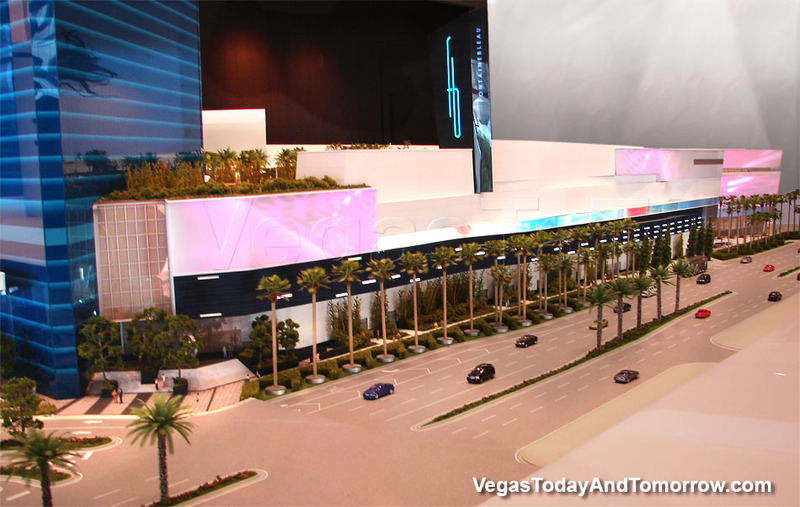 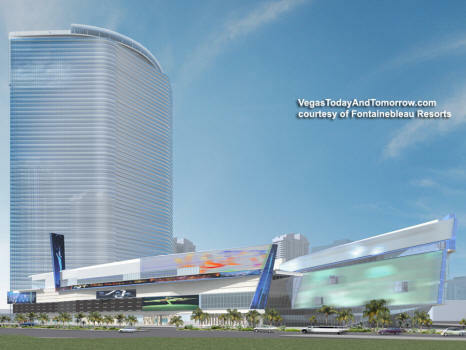 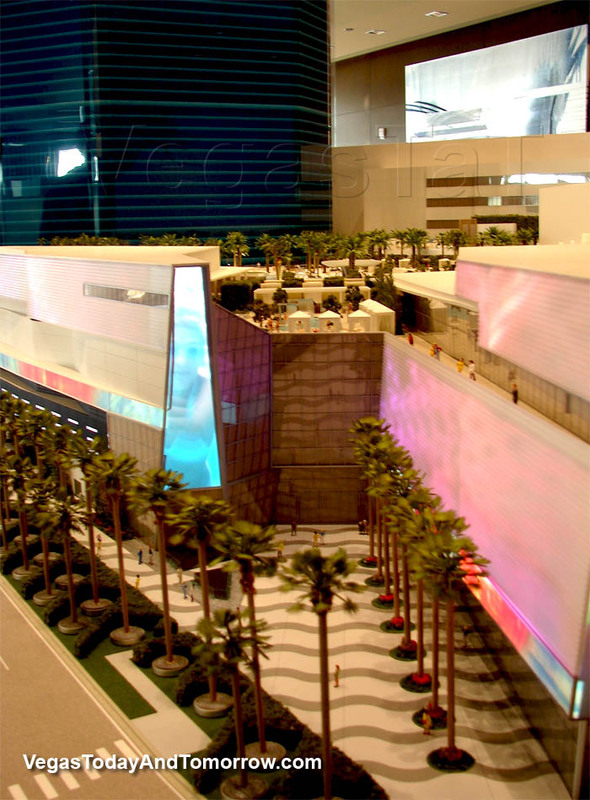 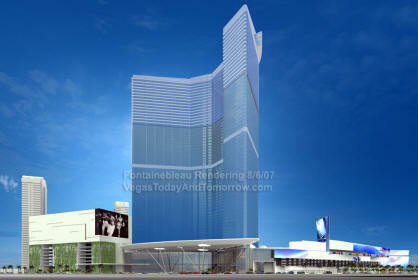 The latest exterior renderings of Fontainebleau Las Vegas has a cleaner look. 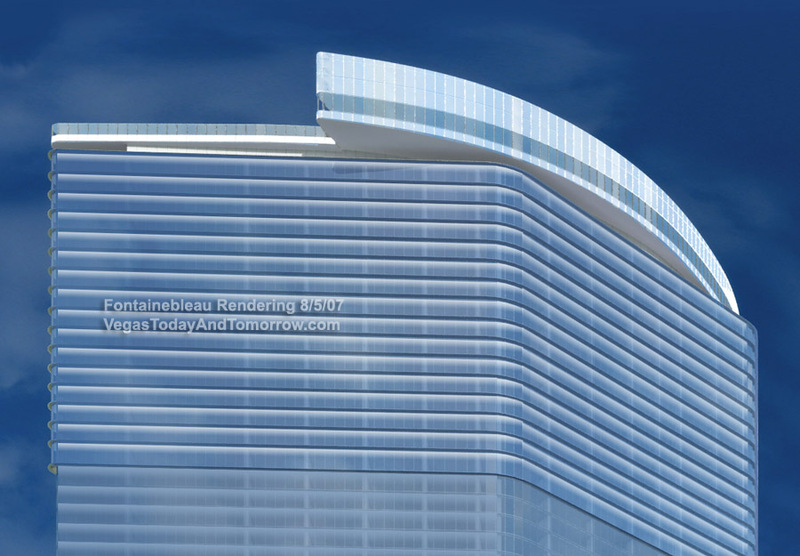 Compared to the earlier renderings (below), the overall design of the podium levels is much cleaner, the penthouse level is thicker and more pronounced, and the corners of the tower are a tighter radius. 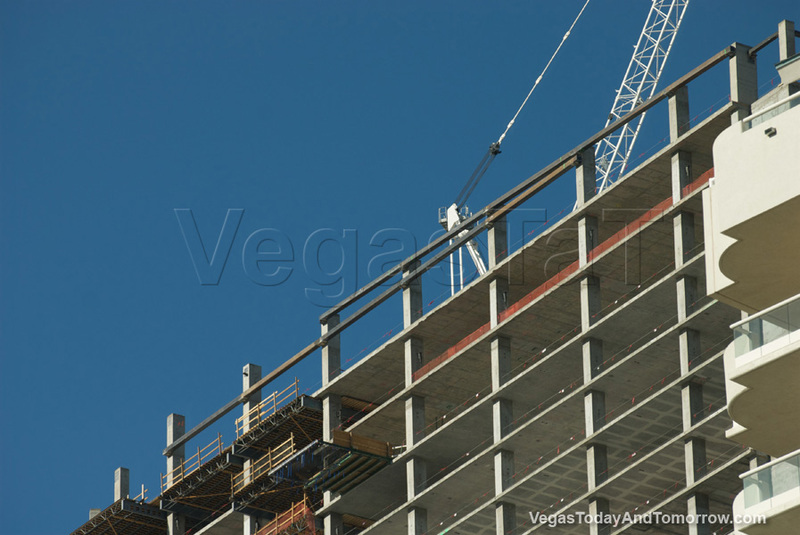 There are no balconies in this project. 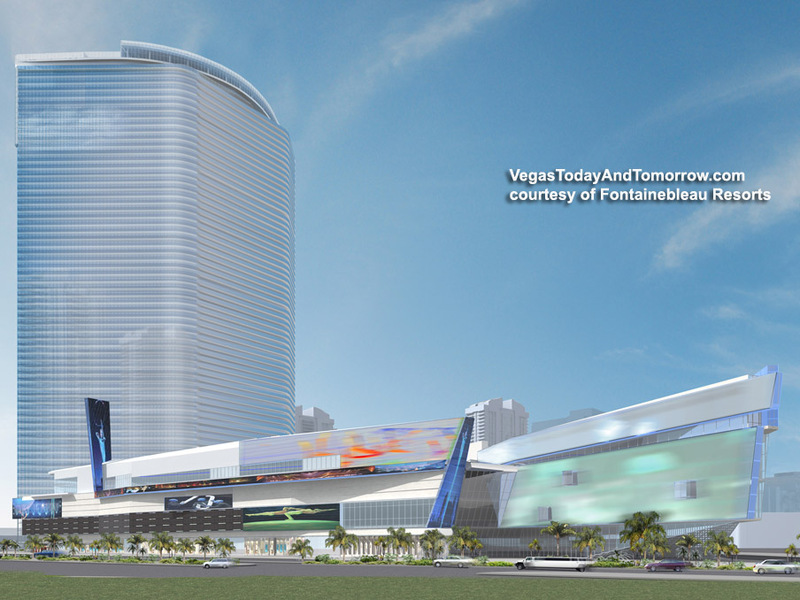 rendering, shows balconies in the center of the tower. 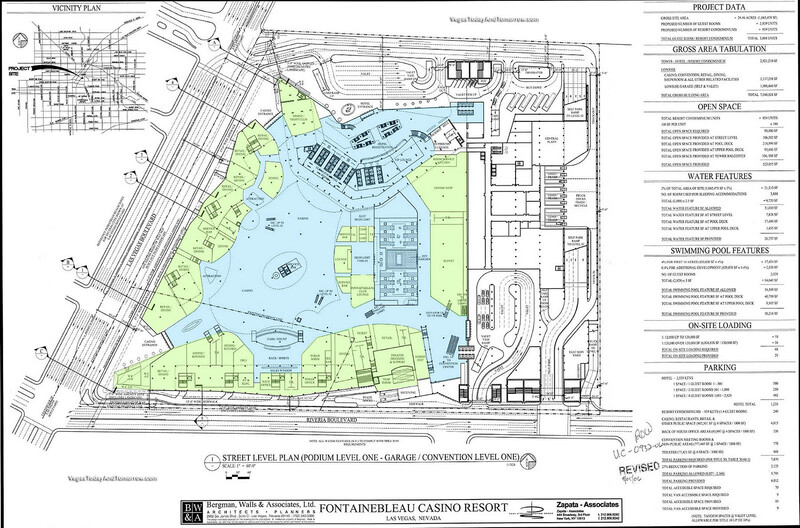 the shape and layout of the Fontainebleau. 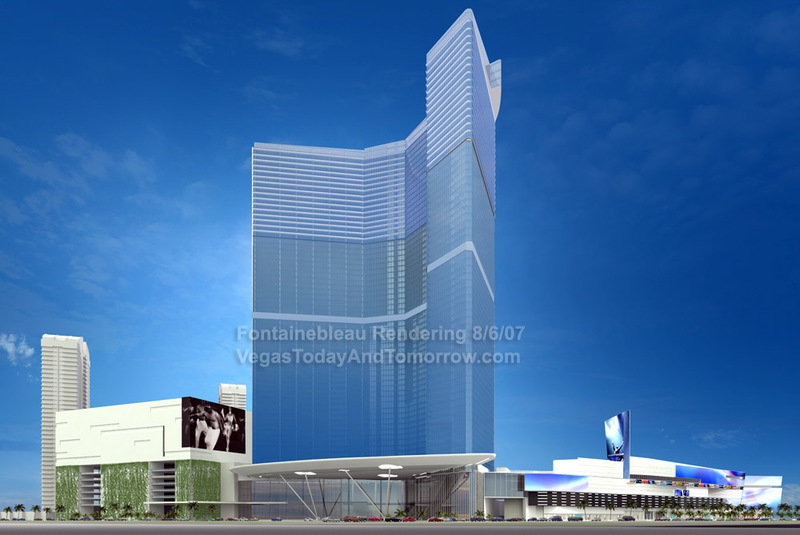 NEWS 6/10/09 Fontainebleau files for bankruptcy while desperately seeking funding to complete the project. 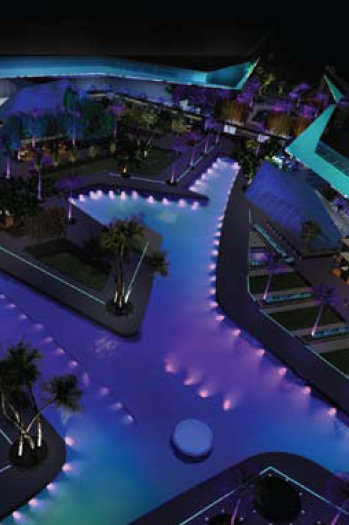 as to what we can expect in the resort. 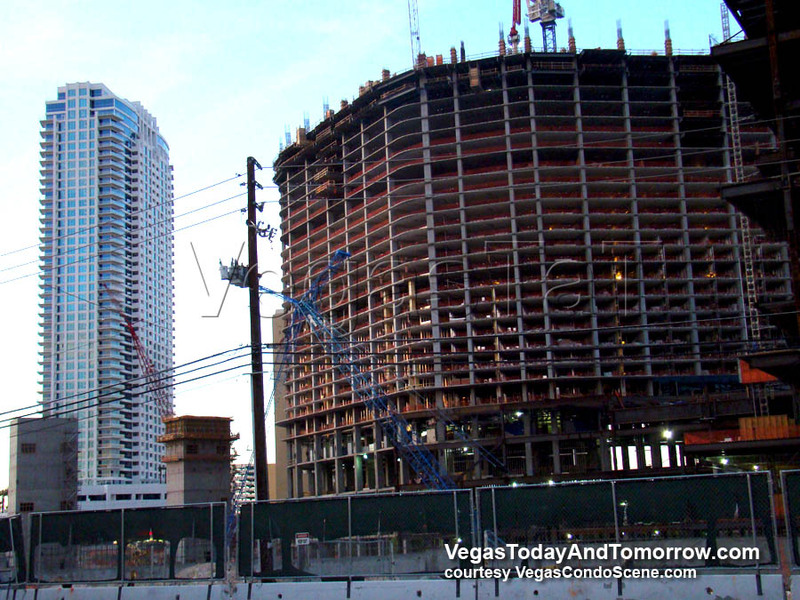 Photo 7/30/07 by Mark Adams, shows Fontainebleau Vegas is blocking views from Turnberry Place (which is causing lots of turmoil from the residents there) due to the height of the parking/convention structure. 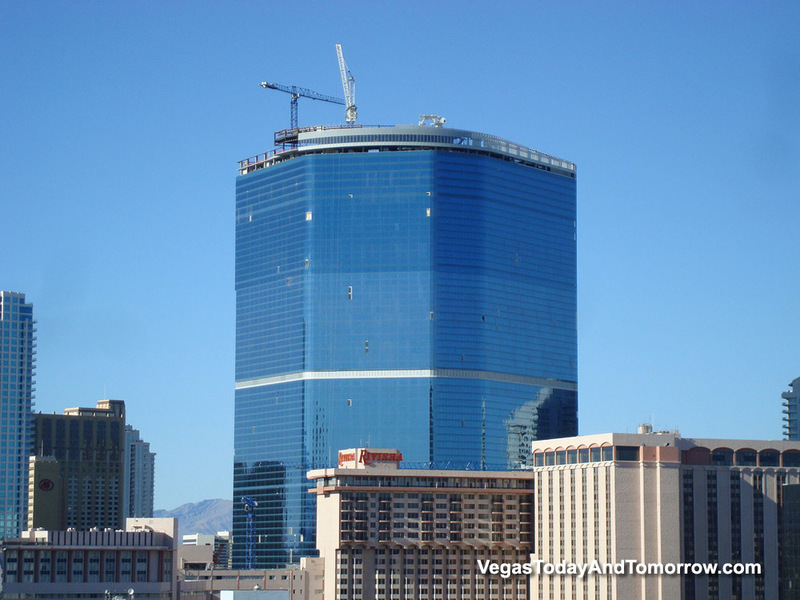 This shot (from the Hilton) shows clearly why Turnberry Places' owners are upset. 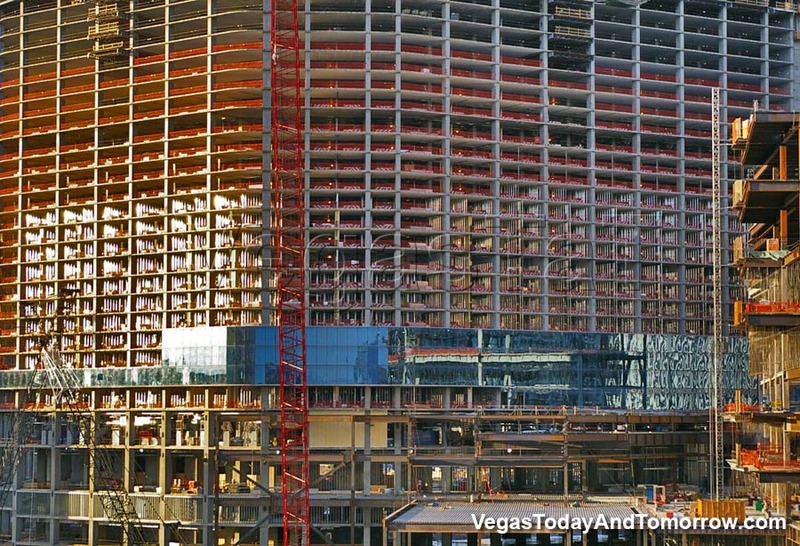 That's one hell of a view-blocking wall. 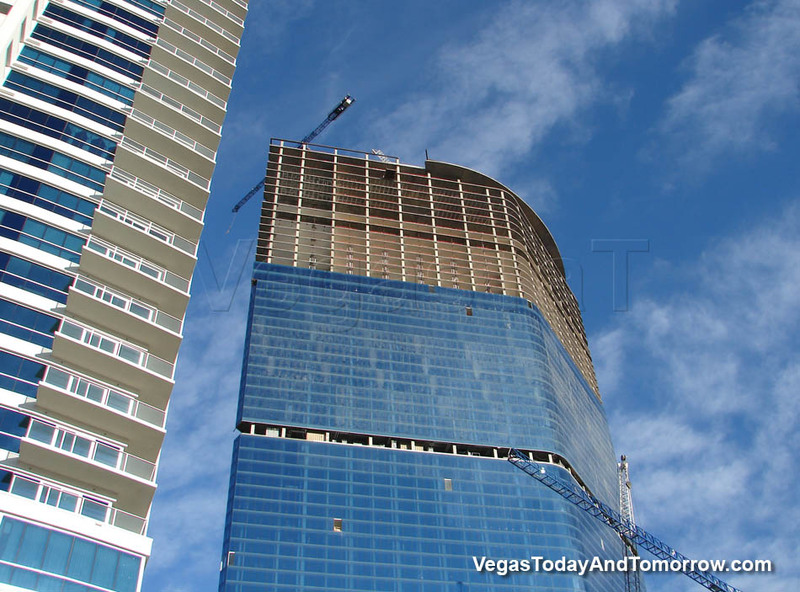 The crown (above) is nearing completion, looking closer we see the gap between the tower and the crown. 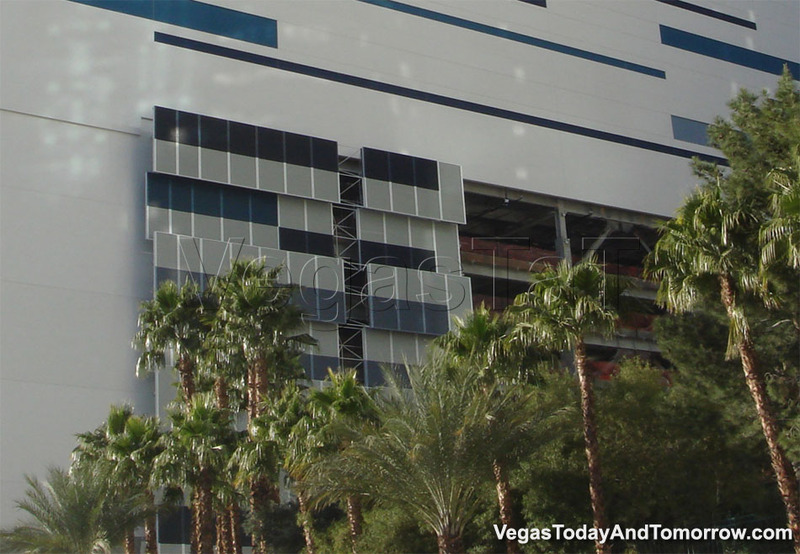 I wonder how they will disguise the works and columns in there. 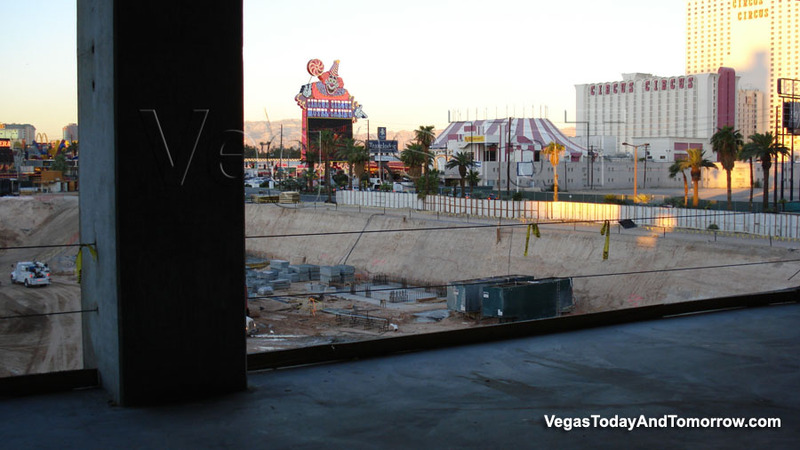 A view of the south side (left) shot from a high floor at the Riviera. 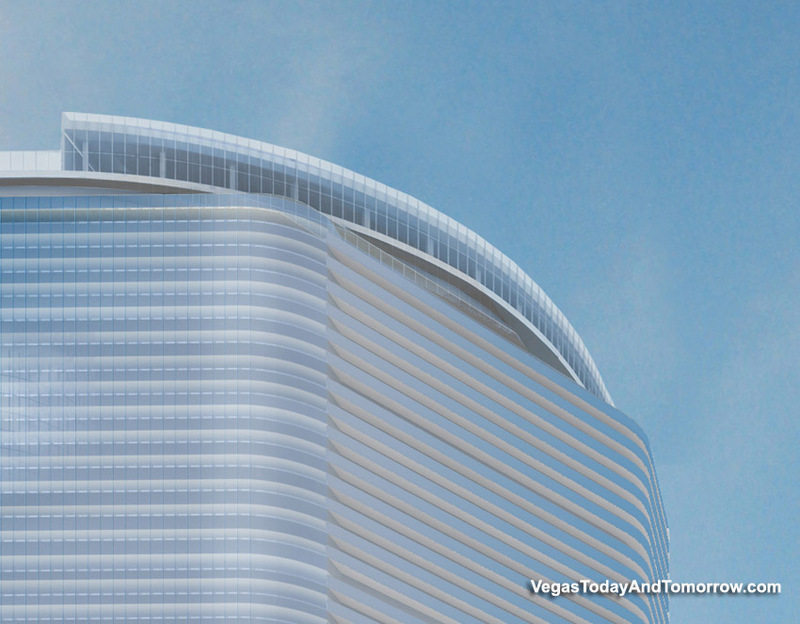 The swoop crown really compliments this behemoth of a tower. 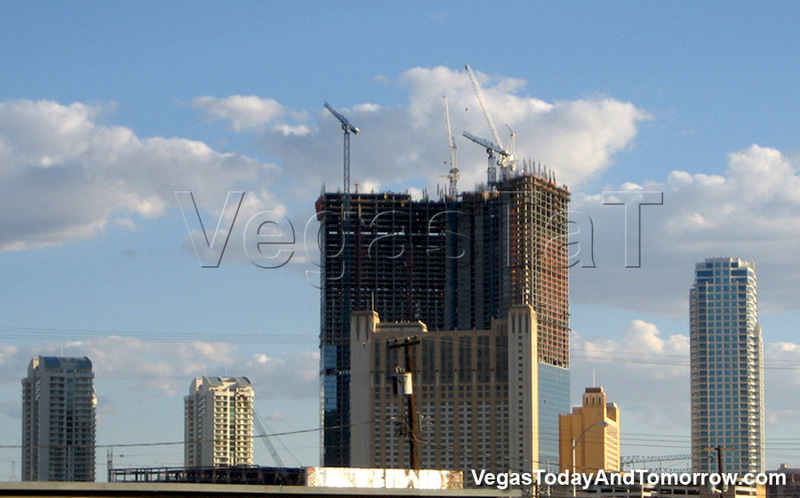 Here's a nice assortment of photos from the past few days. 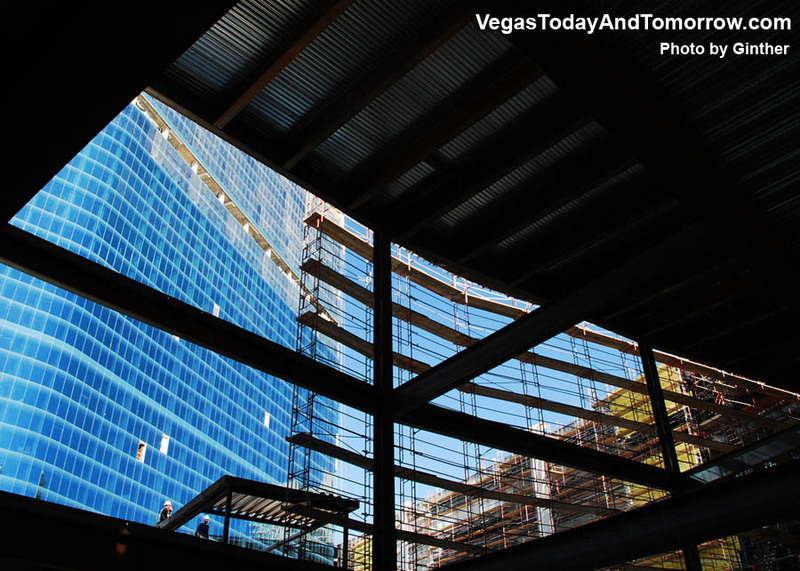 and a great shot from the roaming Daniel Harris. 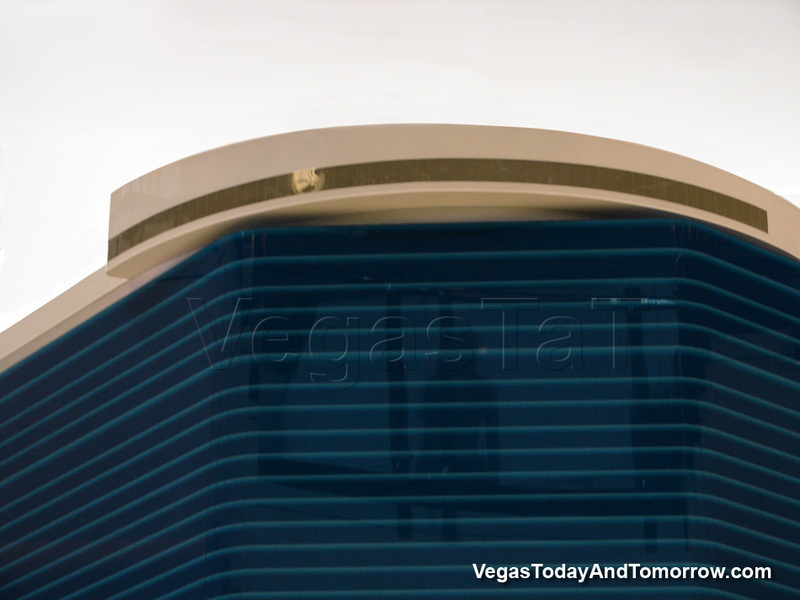 -QUIZ- From where were each of these two shots taken? 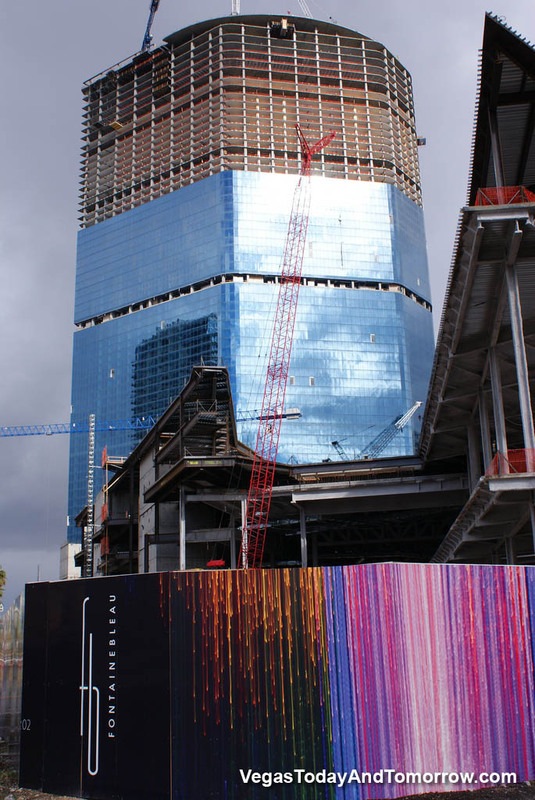 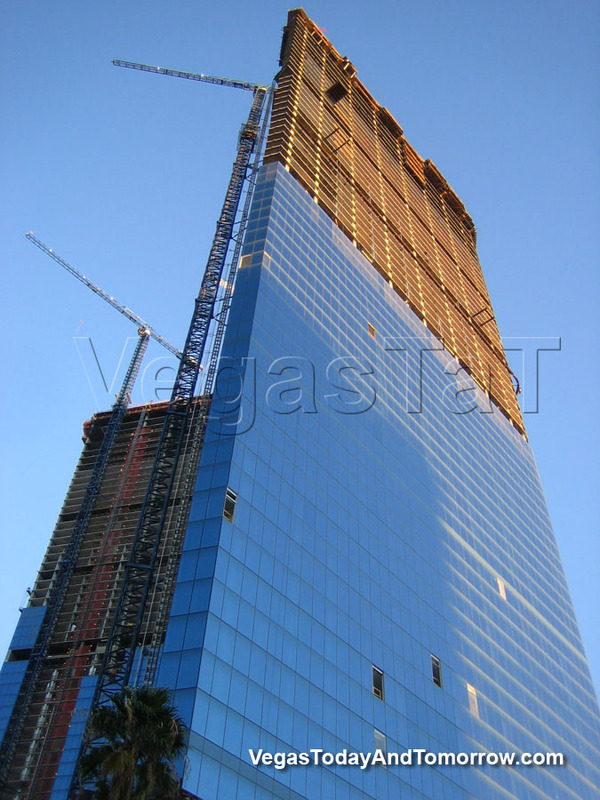 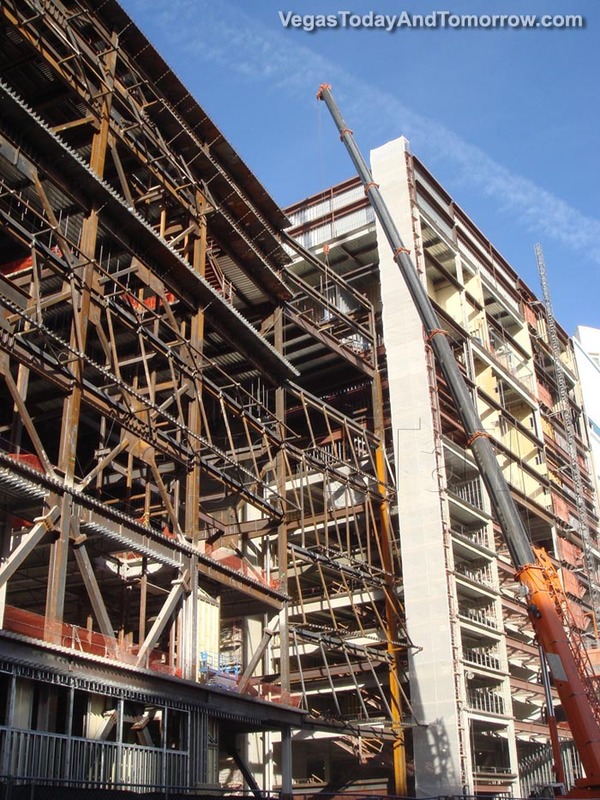 This group shows the progress of the crown; which is getting an opaque, white, glass facade. 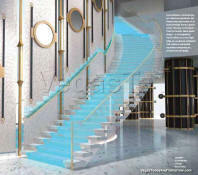 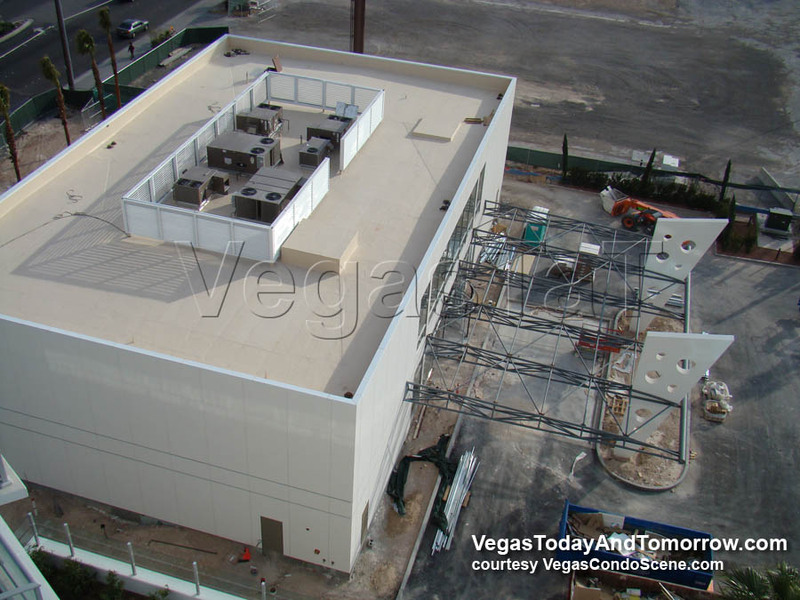 Below, we get a good look at the pool deck. 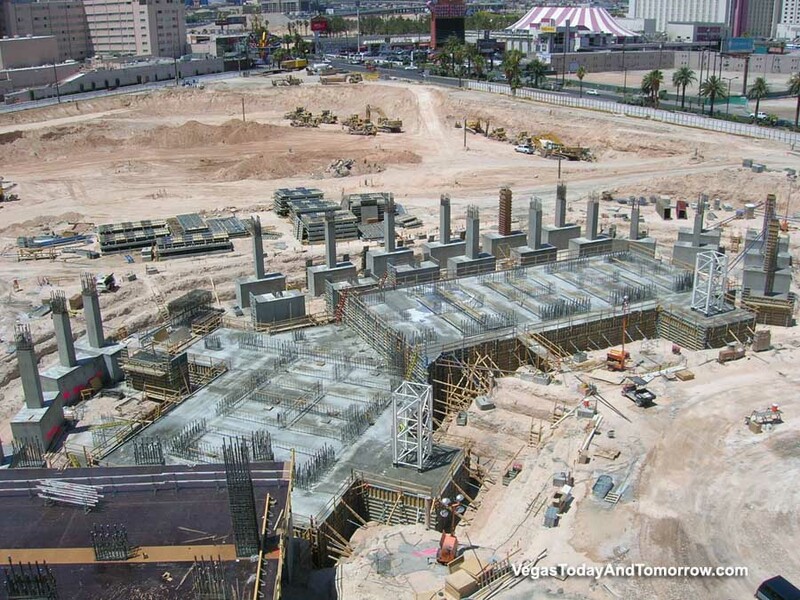 The main Strip entrance in the first shot is taking shape. 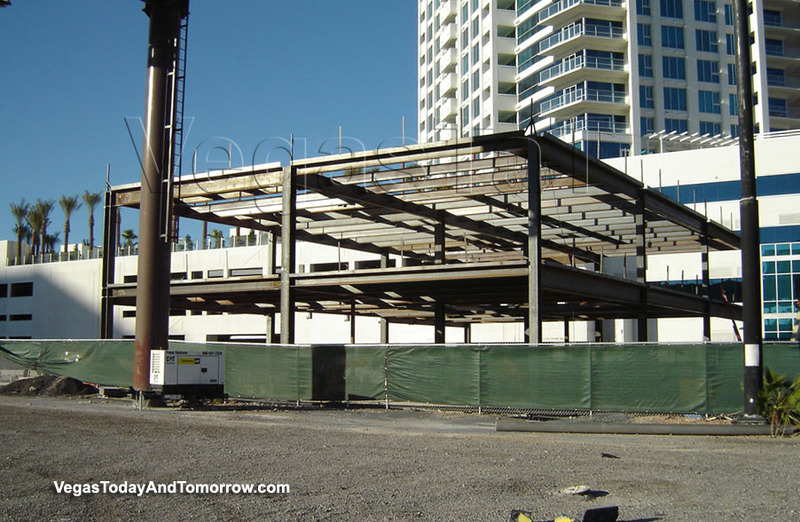 The south side (next photo) along Riviera Blvd., has some interesting shapes where the podium meets the garage/conference center. 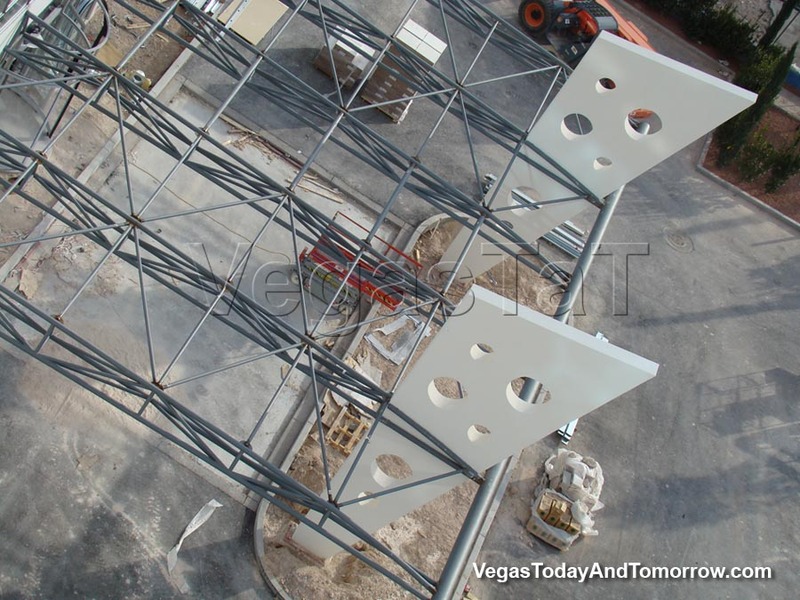 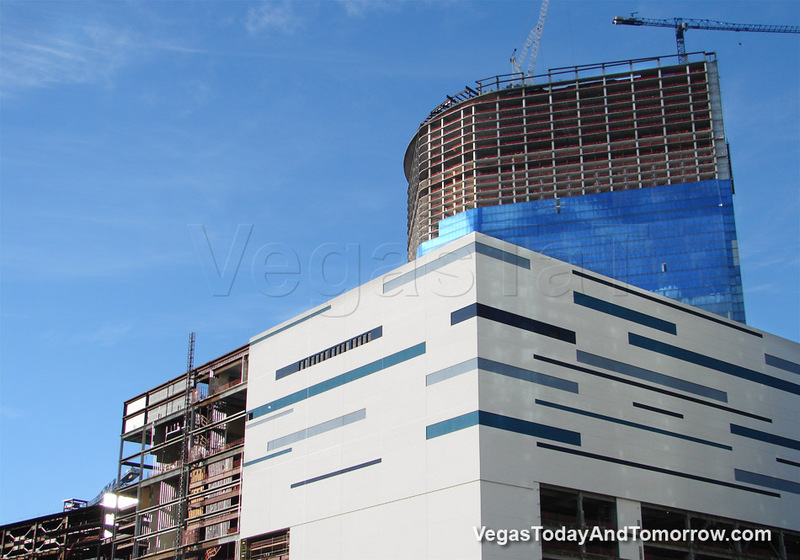 Looking at the backside of Fontainebleau, we can see "decorative" vent panels being installed. 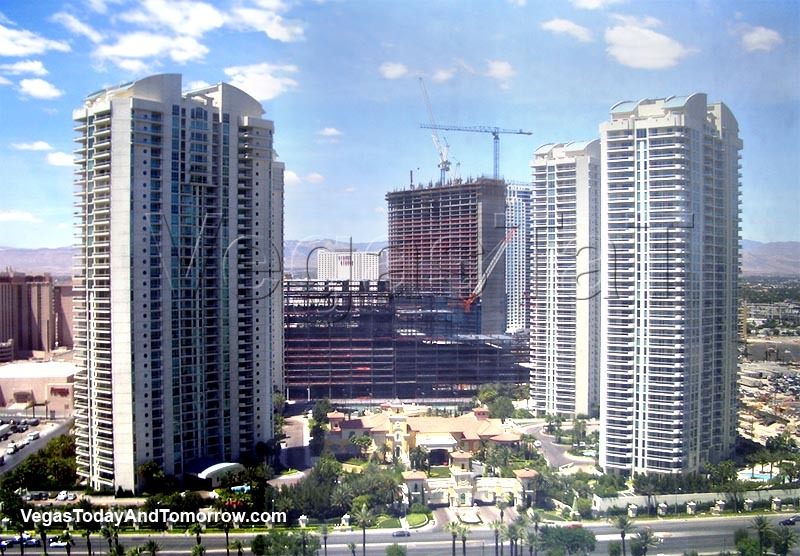 These exist due to complaints and concerns by condo owners at Turnberry Place. 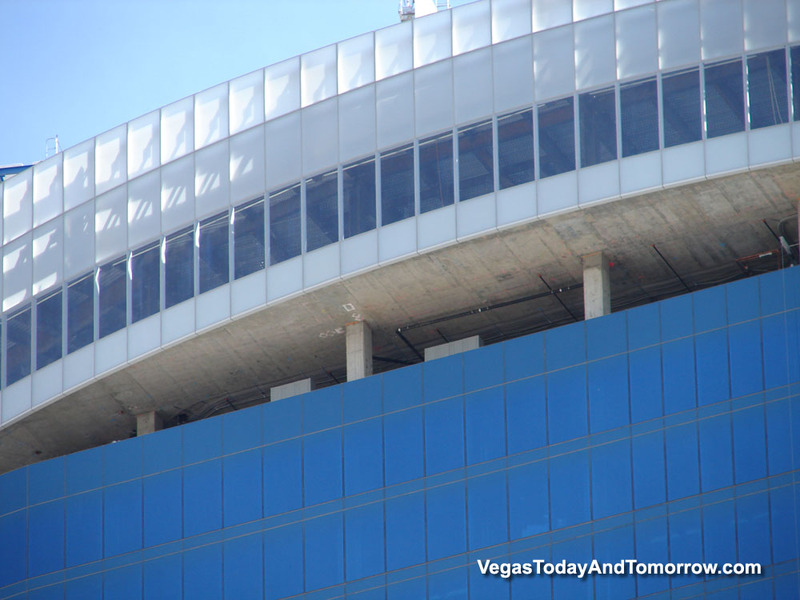 The structure above the parking garage vents is the conference ctr. 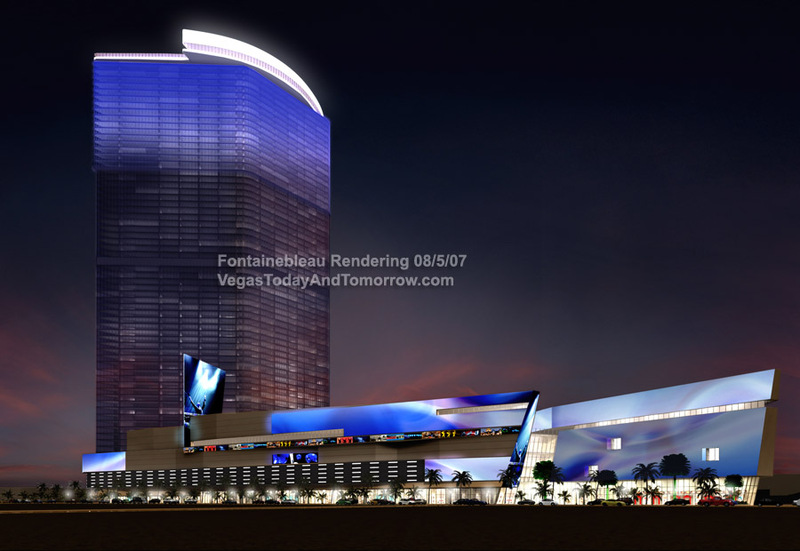 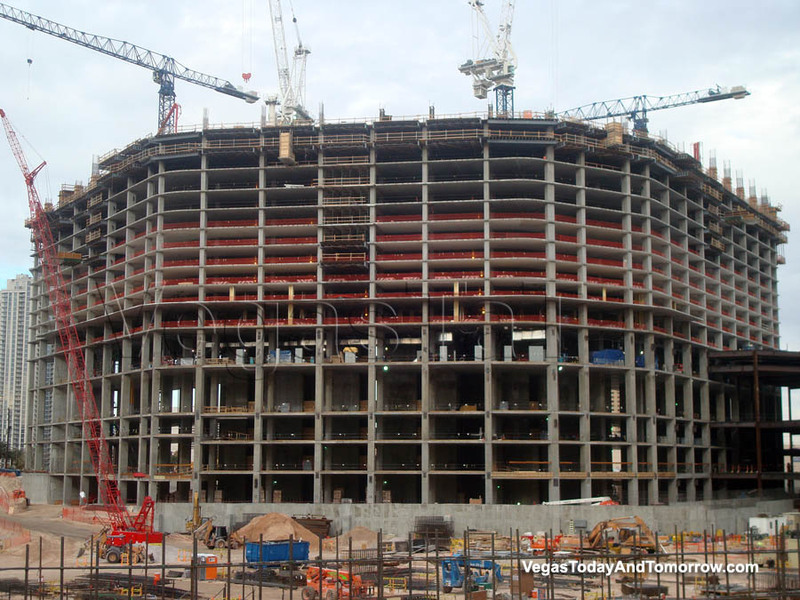 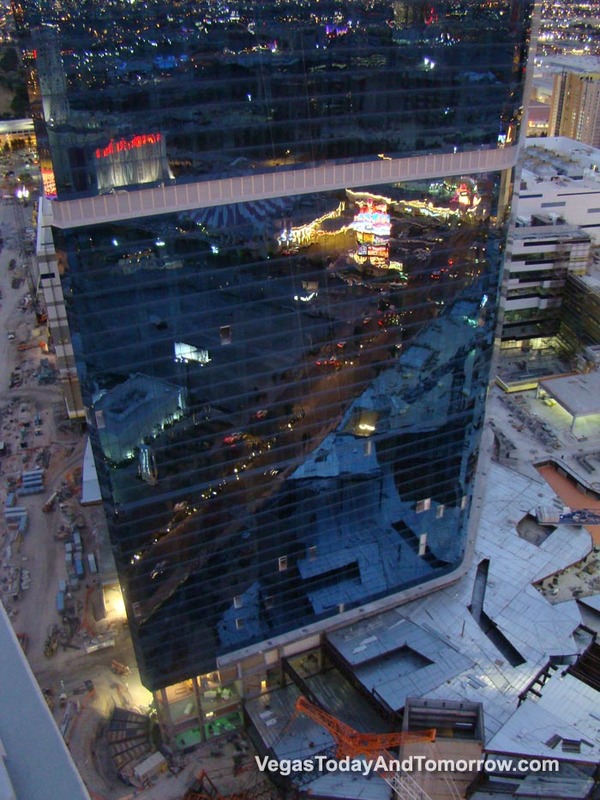 A look around the Fontainebleau site from many angles. 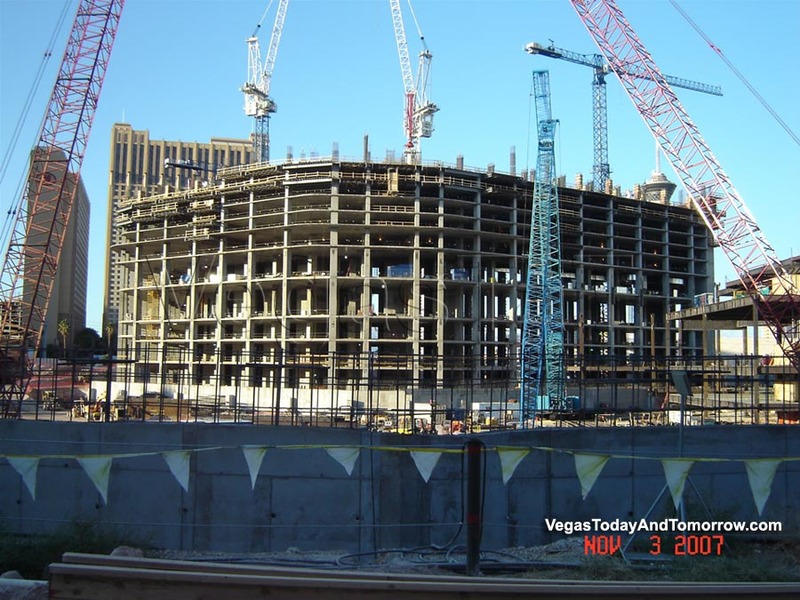 Photos 12/23/08 by Mark Adams, Vince Yarga and Brian Alvarez. 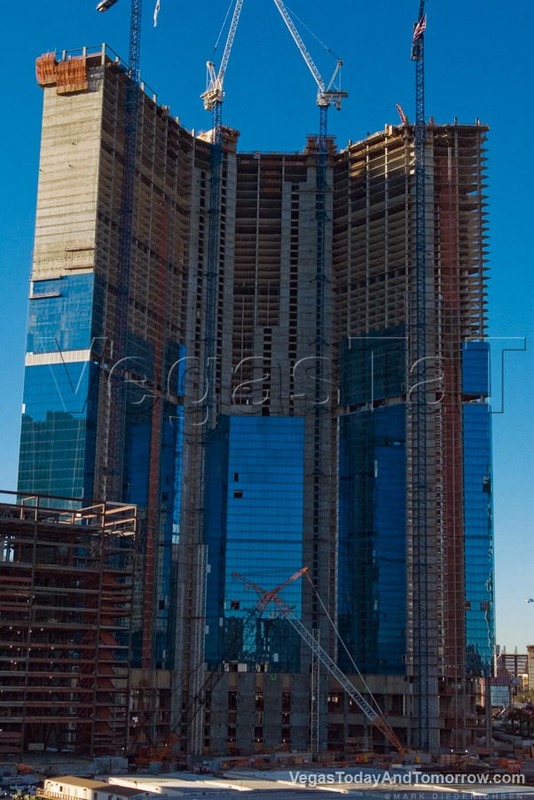 from the flickr photo-stream of Ginther. 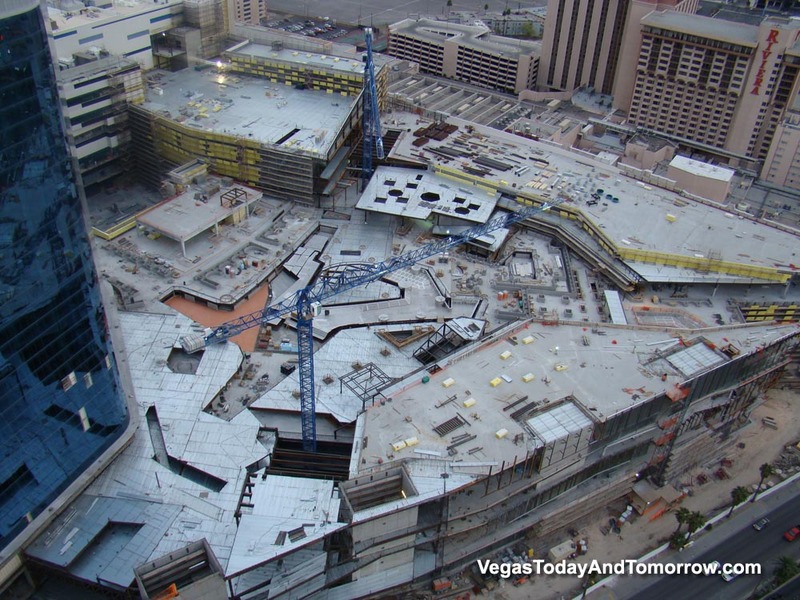 work on the crown has begun. 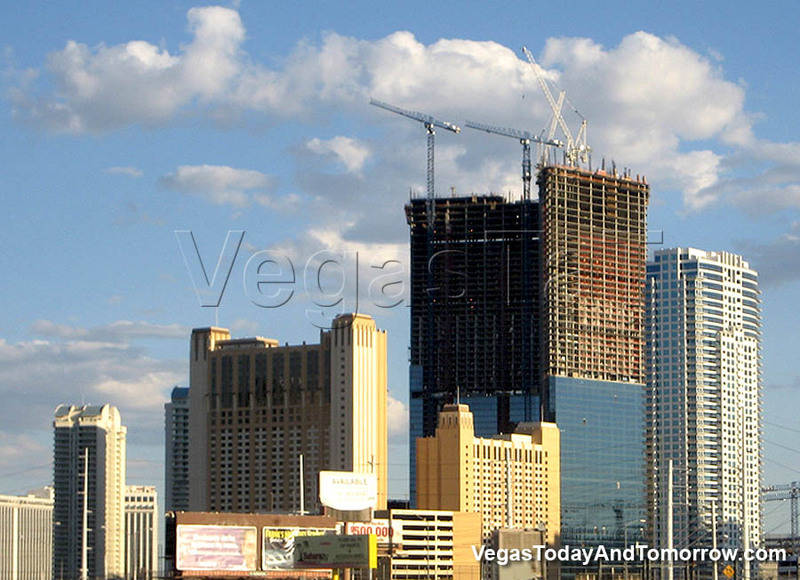 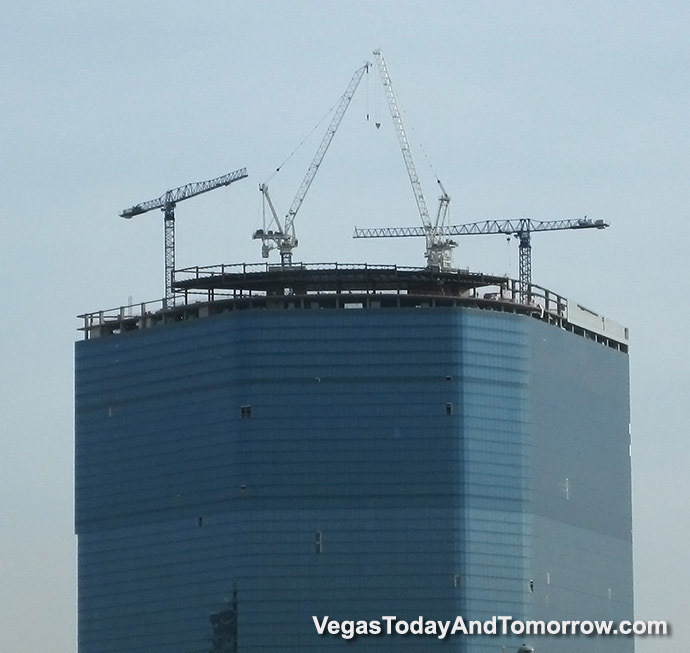 This nice set of photos shows the tower still growing, despite reports that it is topped off. 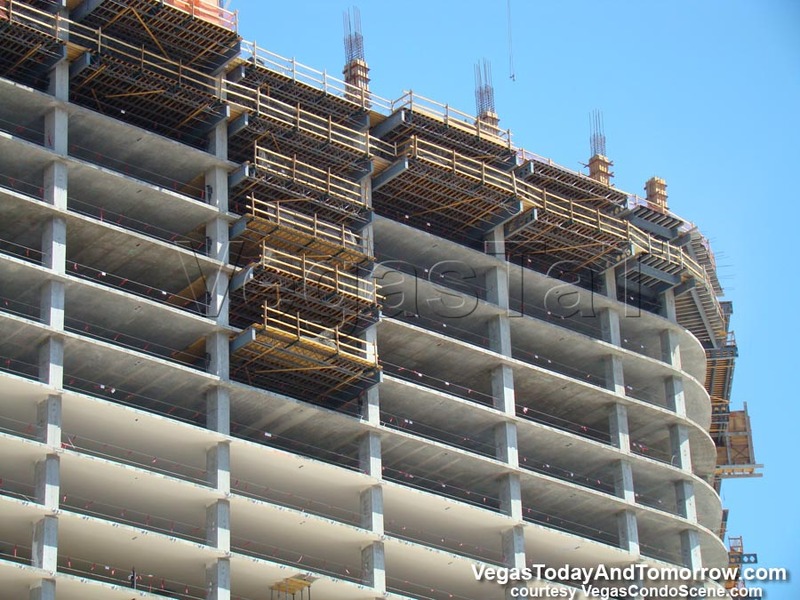 Requests for the real story as to the height and floor counts have not been answered. 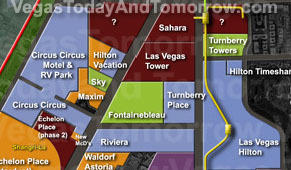 (Turnberry, Hilton Grand Vacations and Sky Las Vegas). 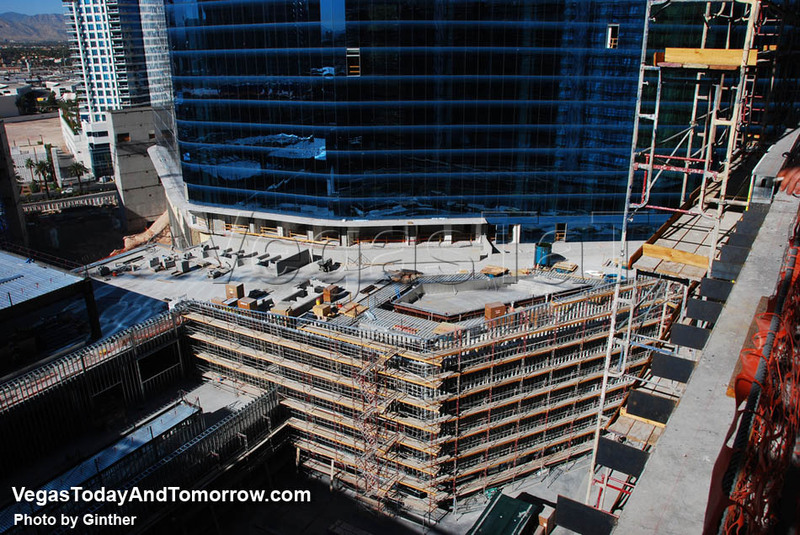 One floor to go before the two-story crown level. 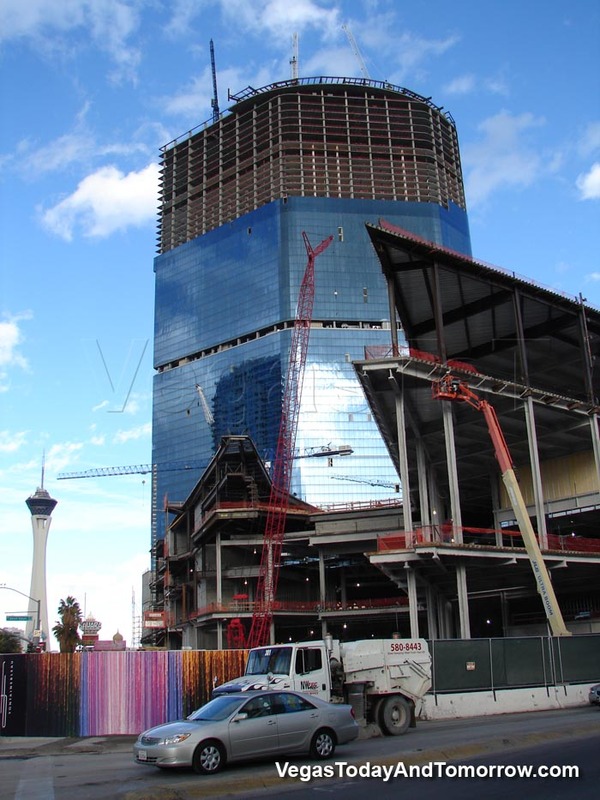 filling in, while the tower continues rising. 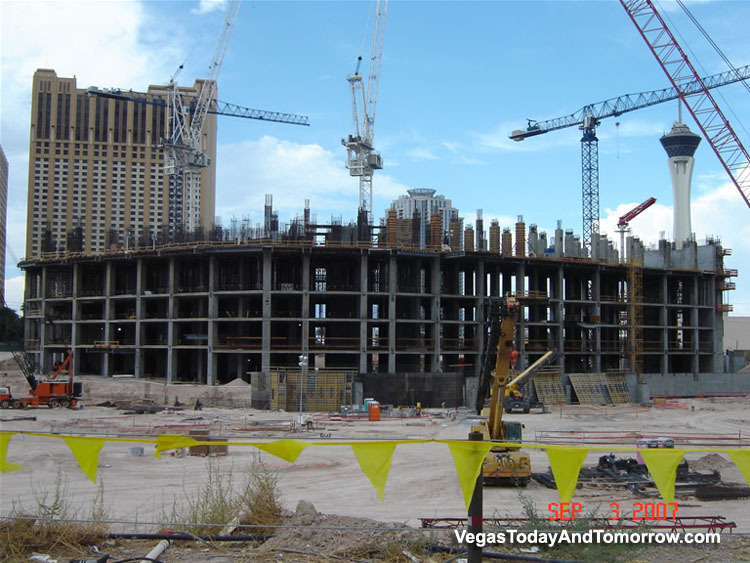 Four shots from 7/13/08 by Mark Diederichsen, show the progress of Fontainebleau. 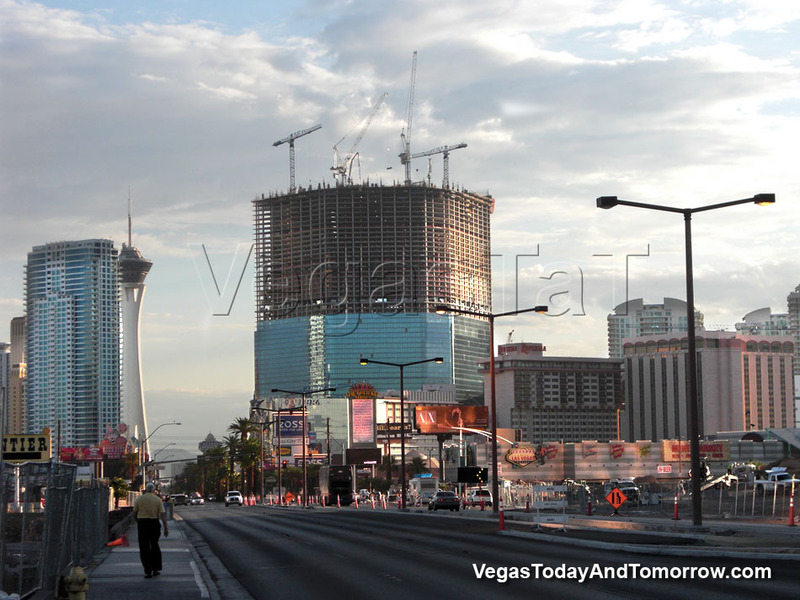 The photo (near left) by Aaron Auxier, shows the project as seen from The Strip. 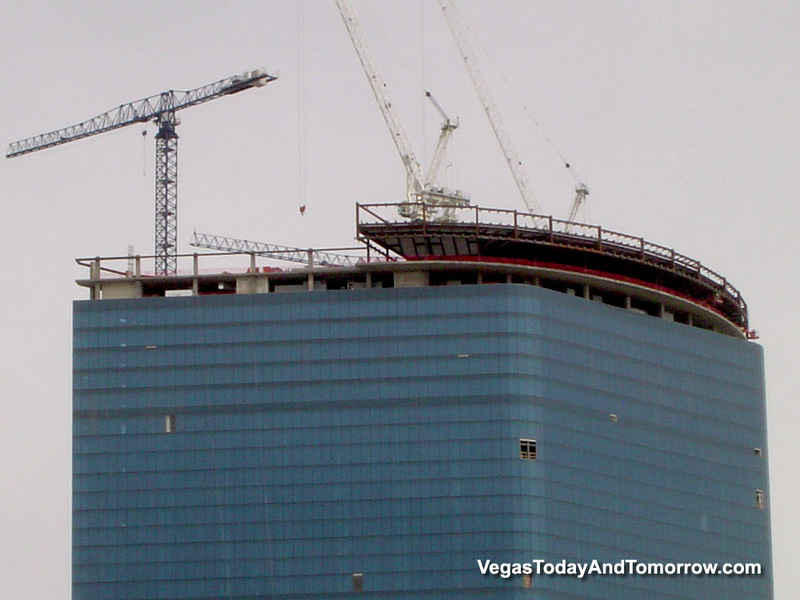 Working on the 37th floor and podium filling in. 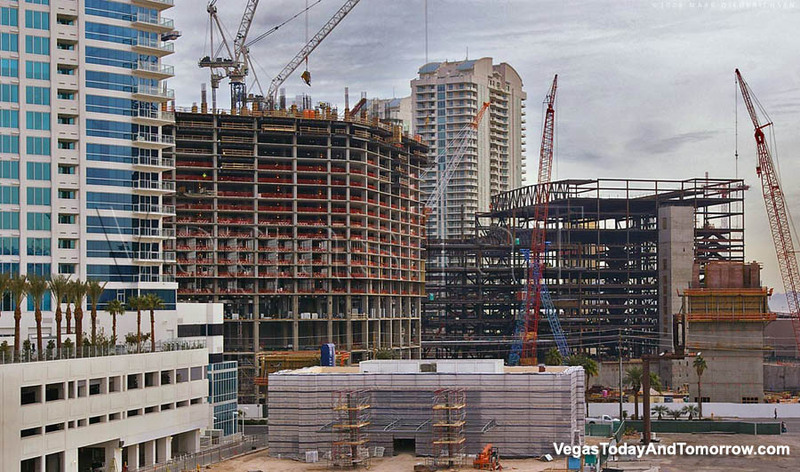 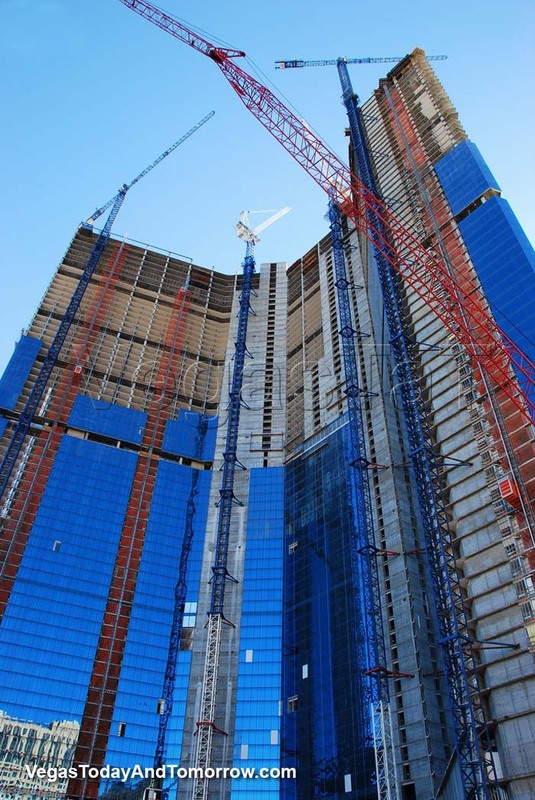 Thirty floors and counting, Fontainebleau's construction pace is steady. 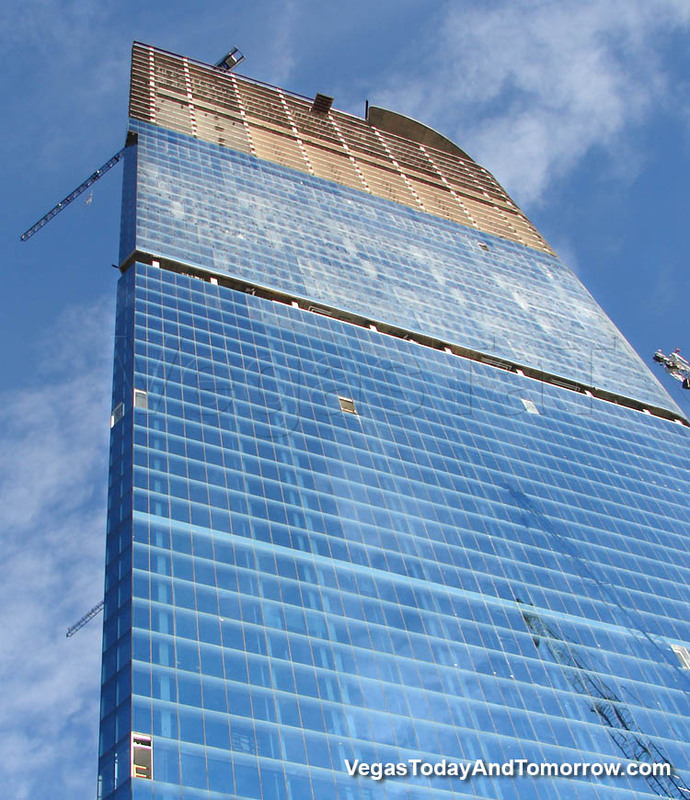 The bleau glass shows off the subtly-curved shape of the tower. 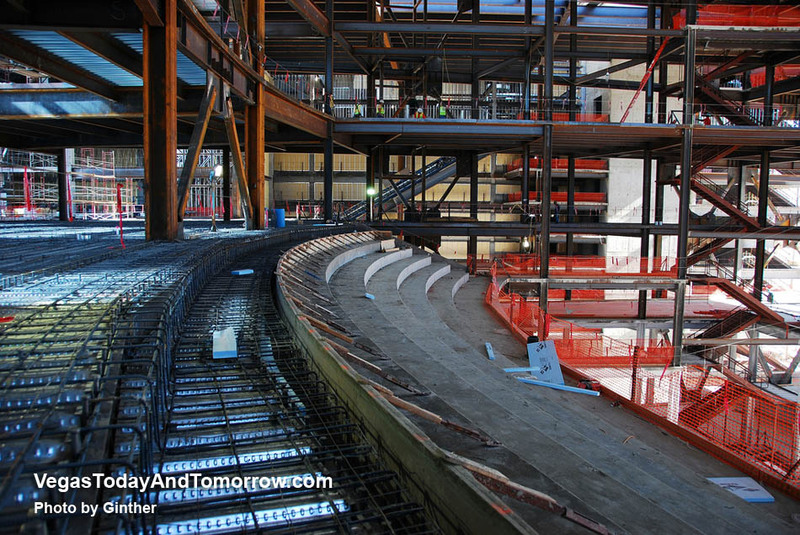 Work has begun on the podium (right). 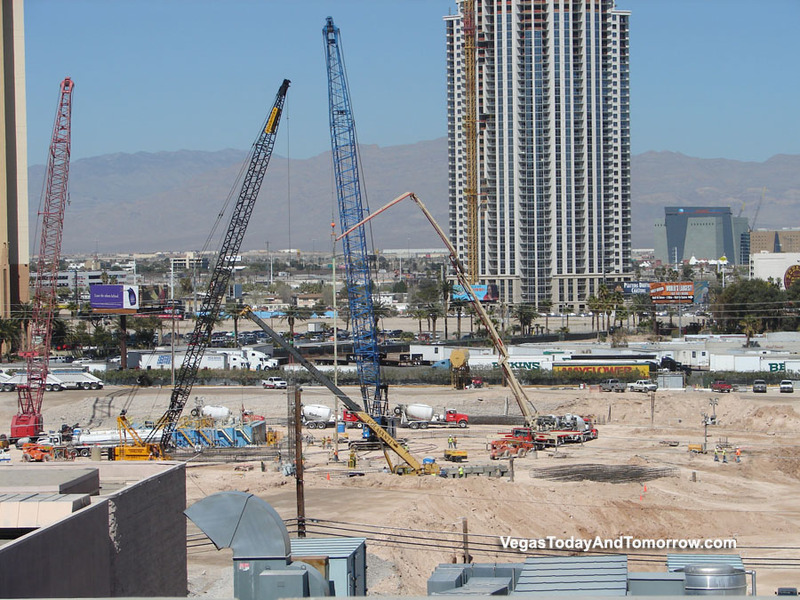 Former Strip view from Turnberry Place 11th floor. 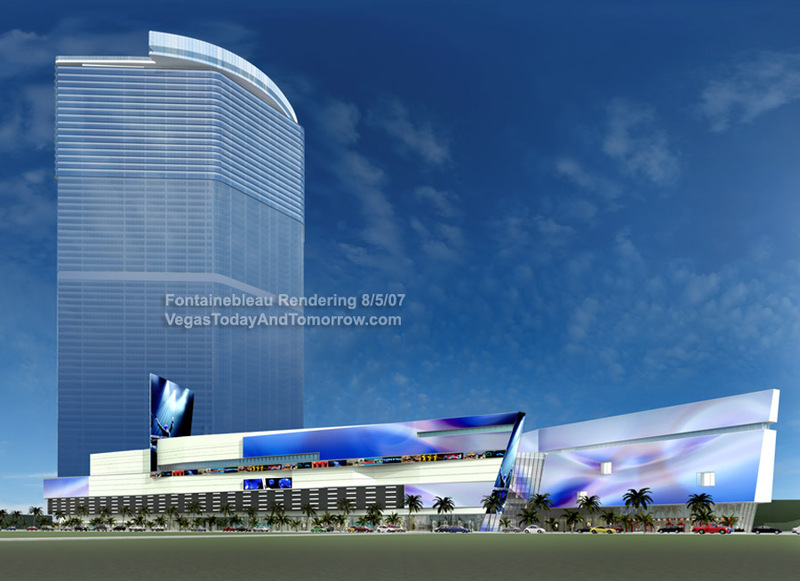 Fontainebleau's parking garage/convention center blocks what was a great view. 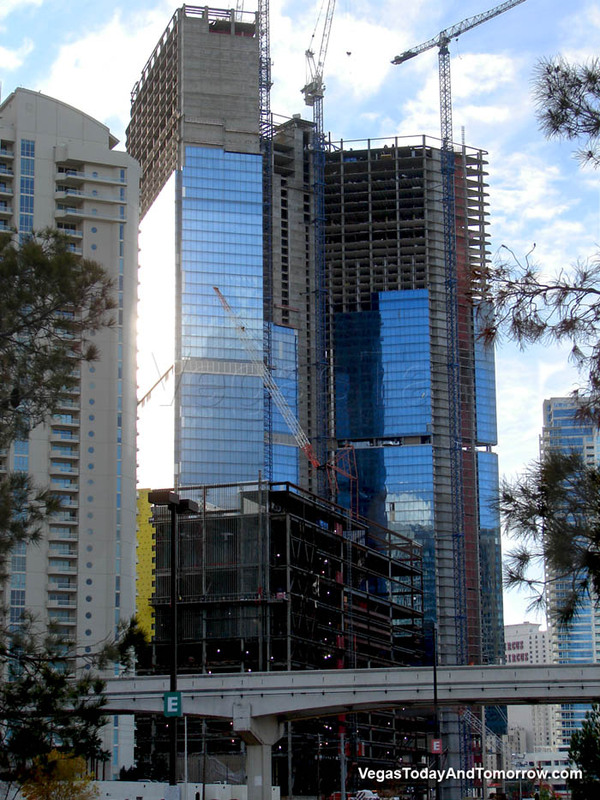 Shot from Turnberry Place, this photo shows Fontainebleau from the back and how the parking/convention center is creeping northward. 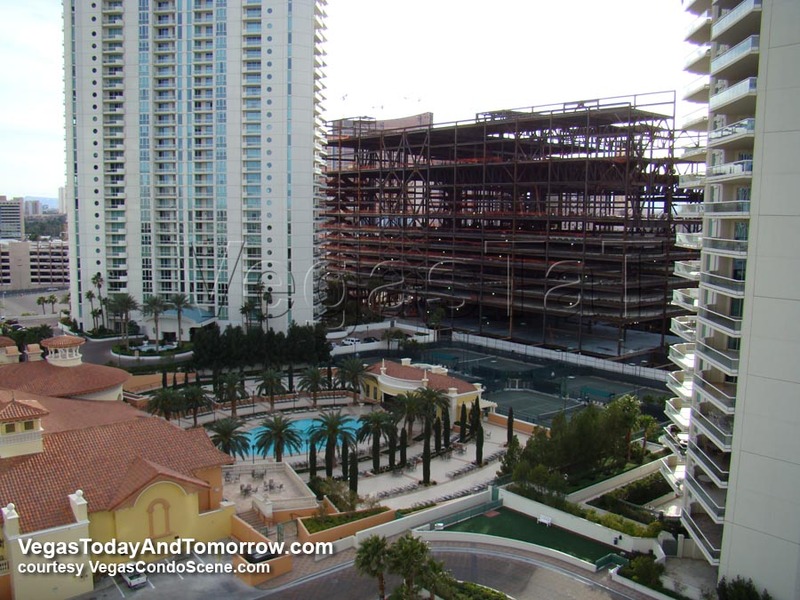 Work continues on the Fontainebleau Sales Center (foreground) while the resort rises. 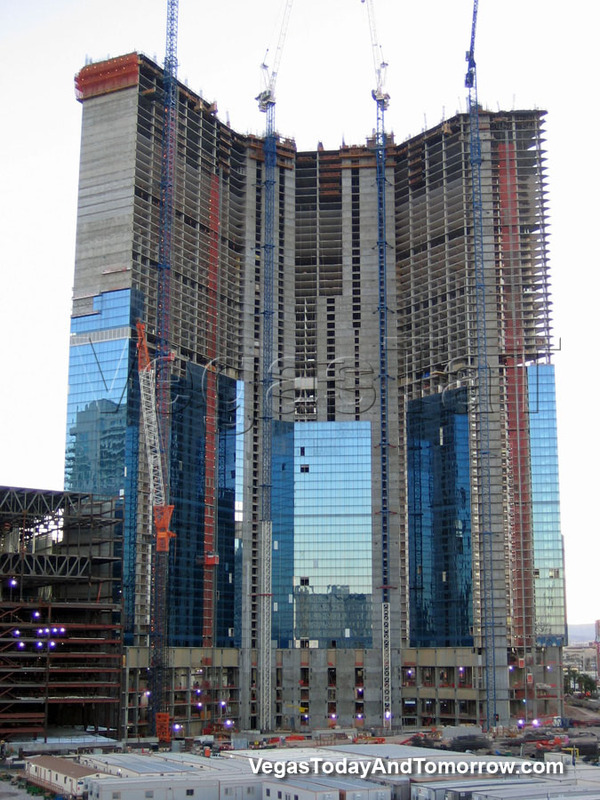 Main tower up to the 21st floor. 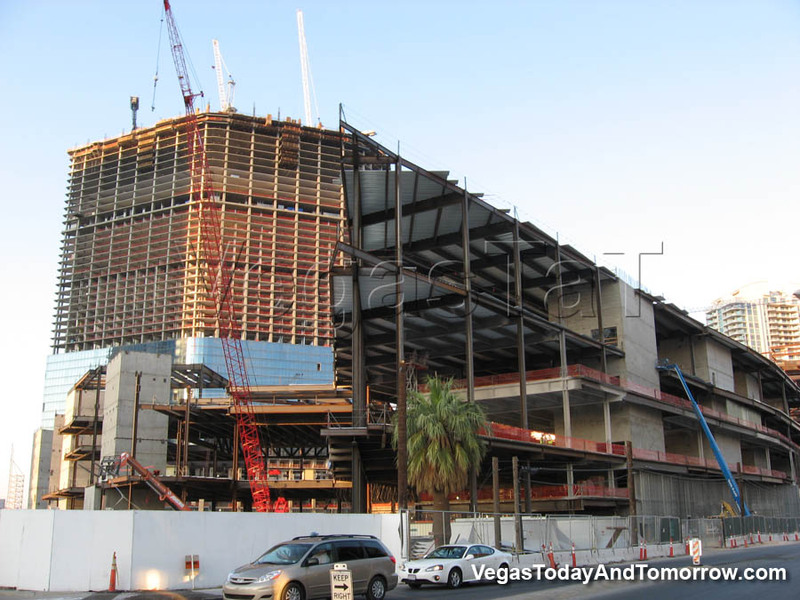 has reached its full height. 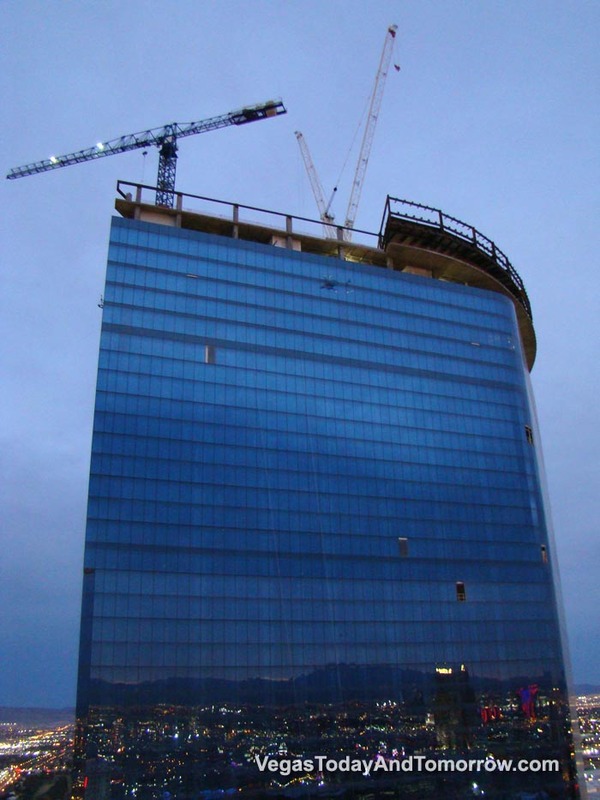 Working on the 17th floor, no glass yet. 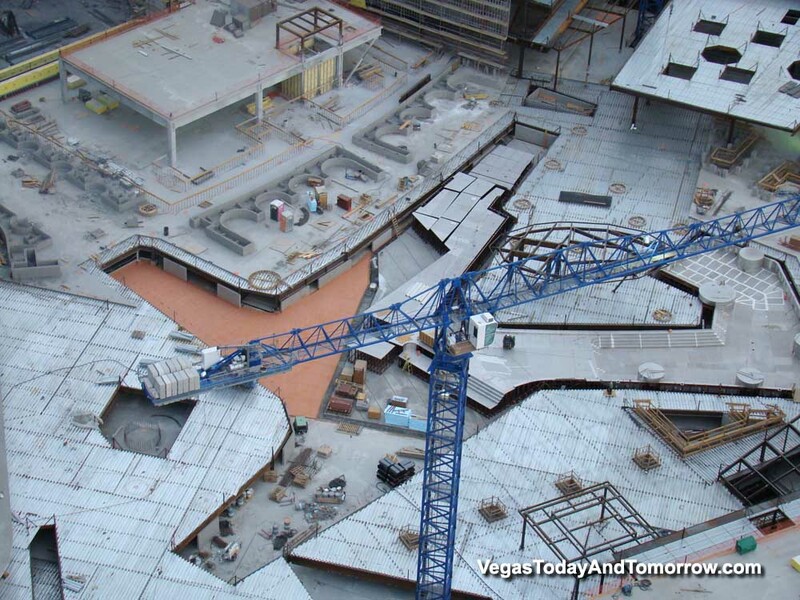 to look serious. 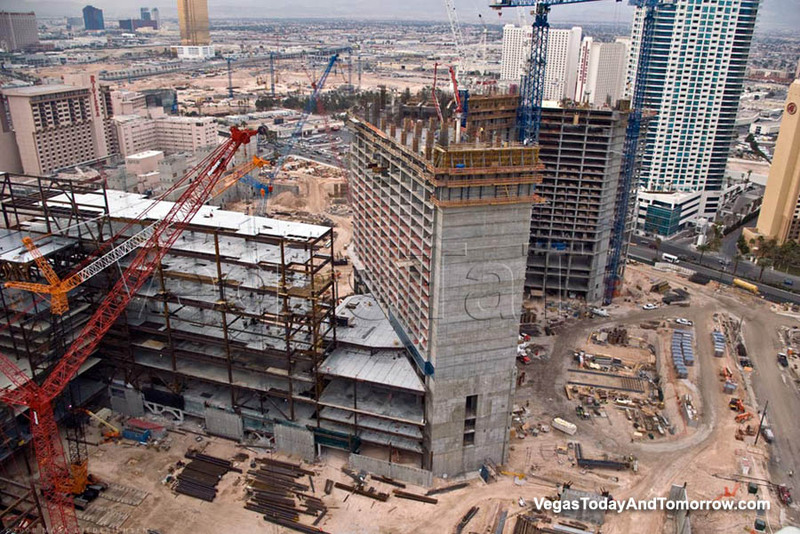 11 Floors already. 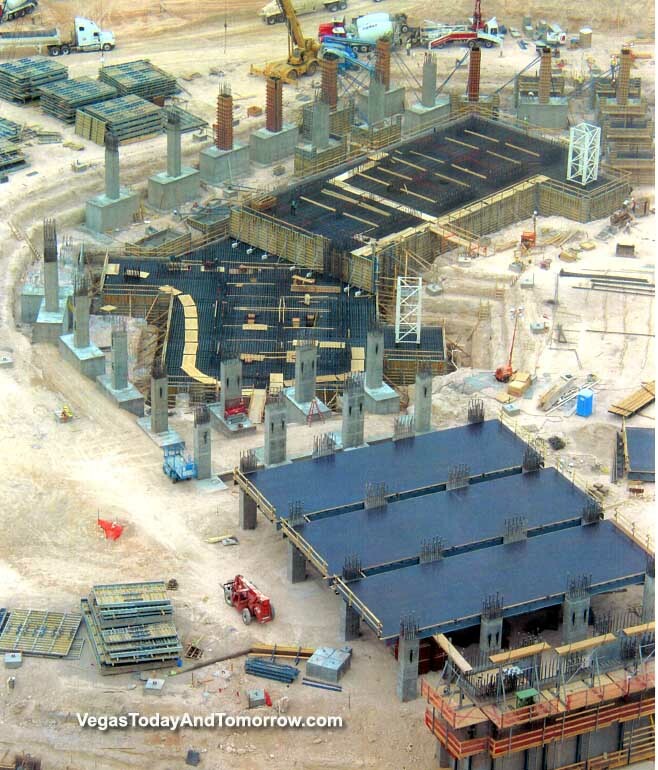 will be the podium levels of the resort. 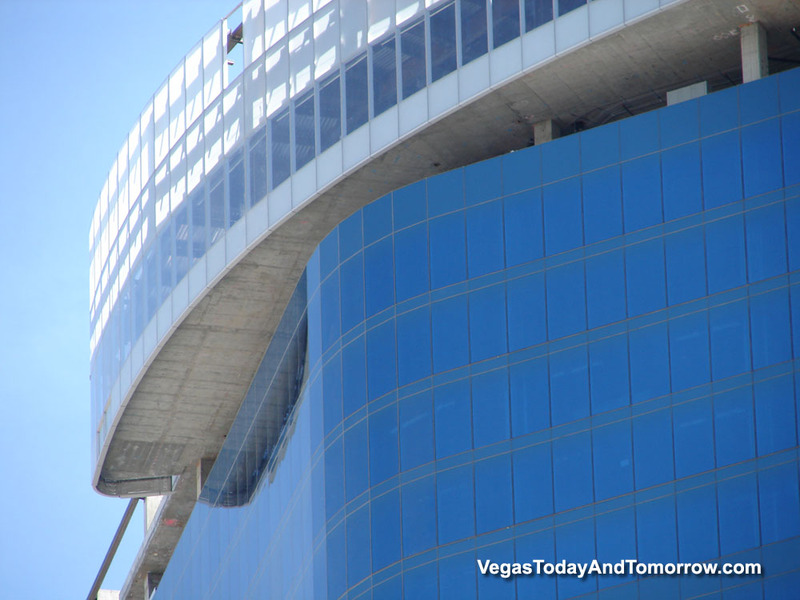 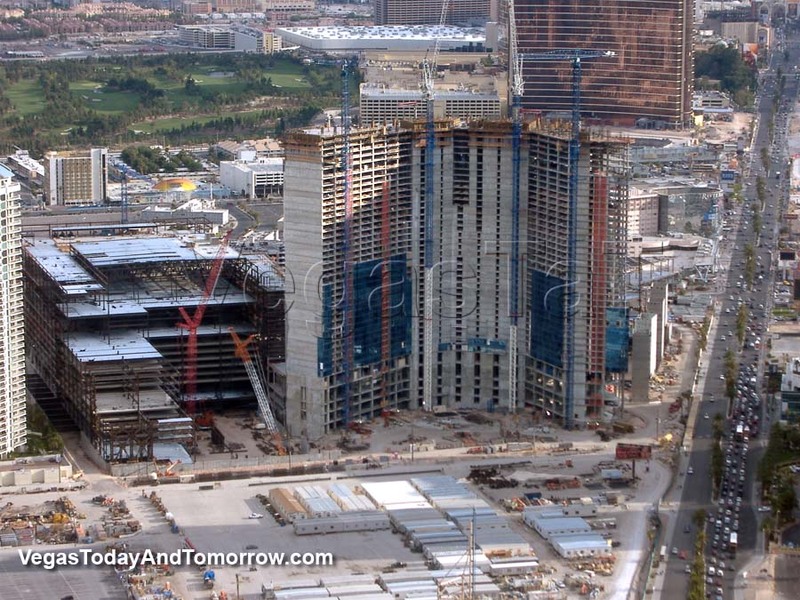 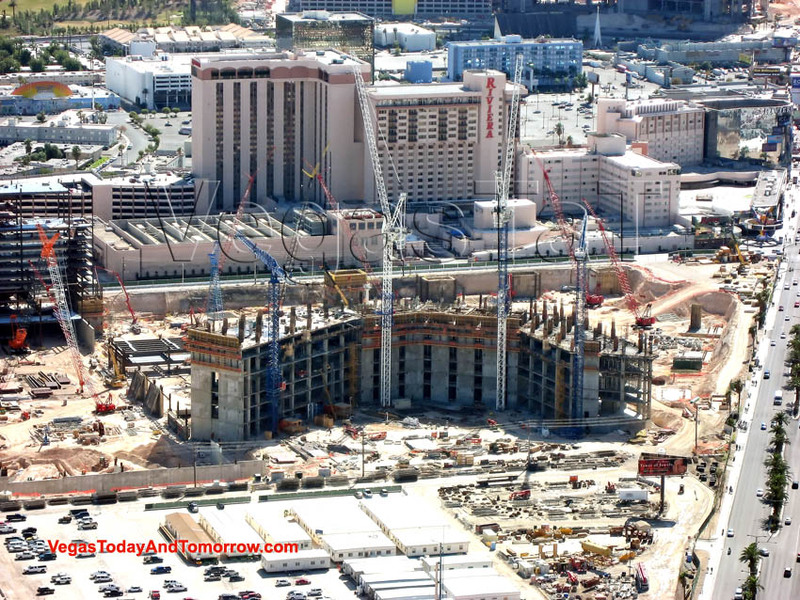 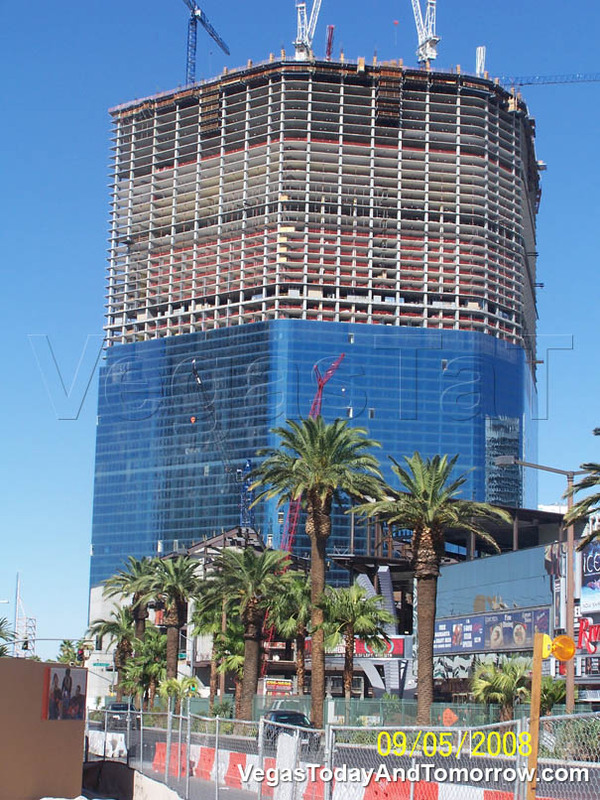 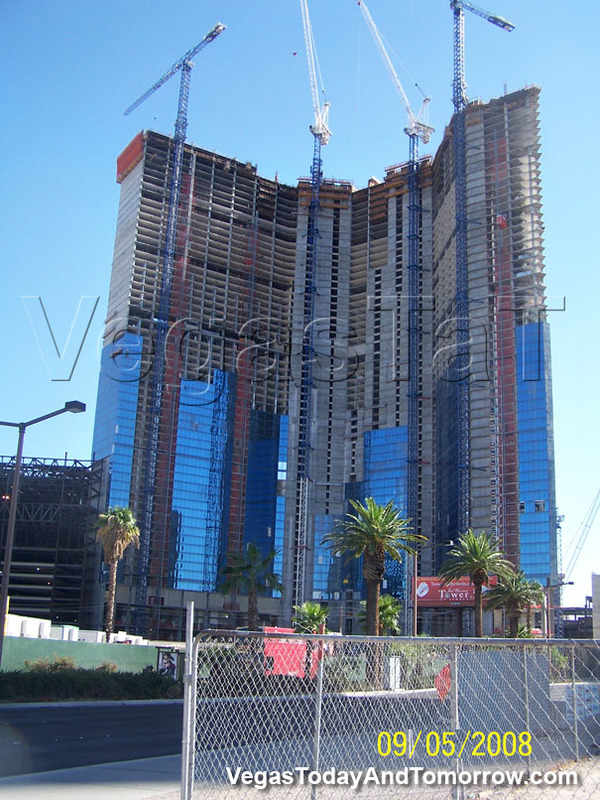 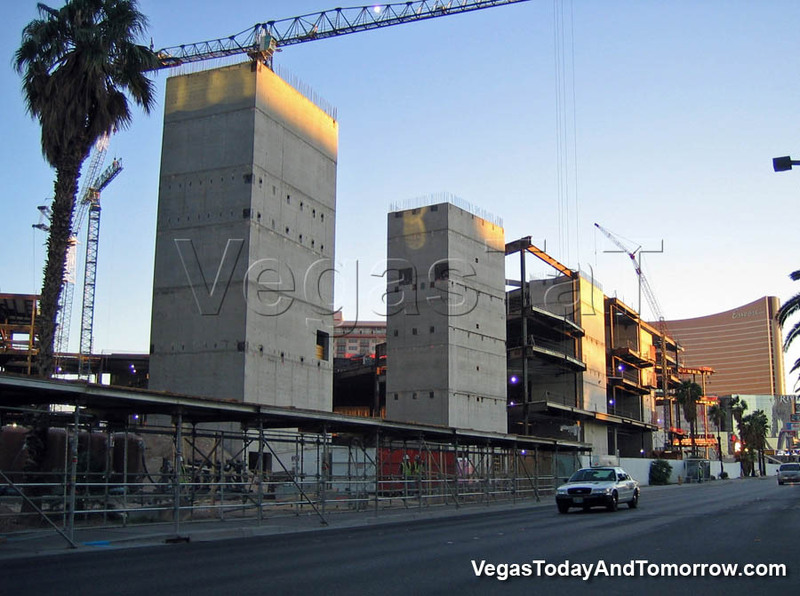 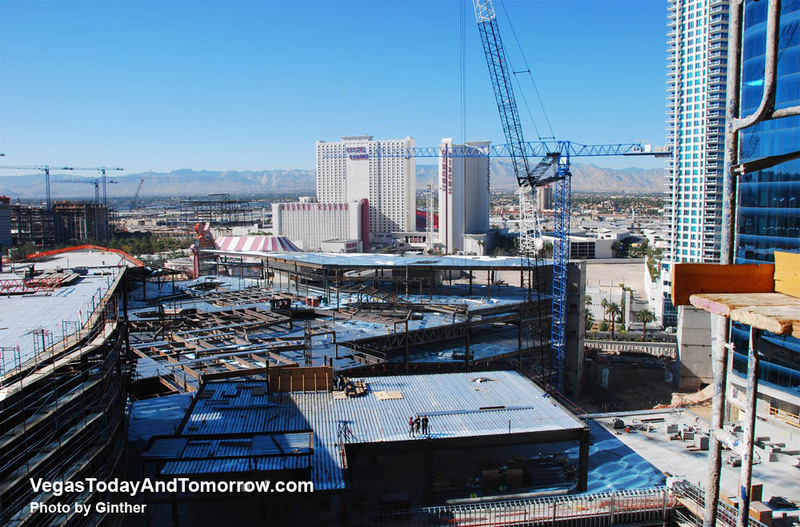 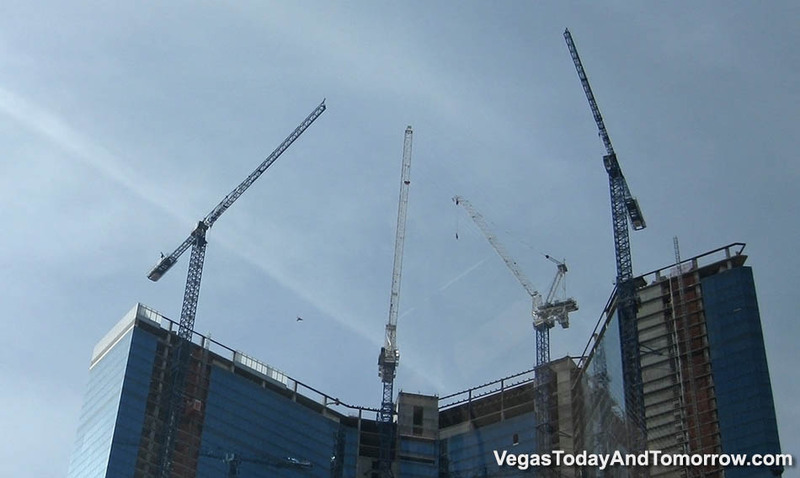 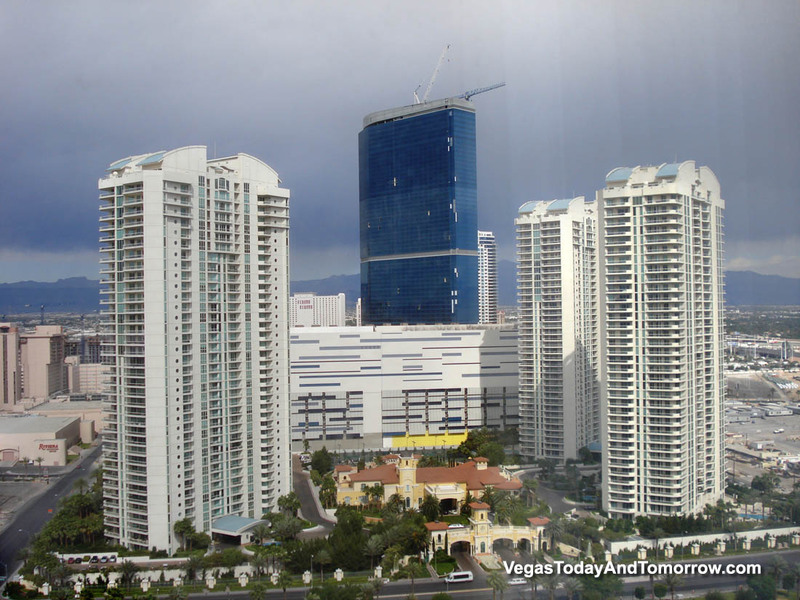 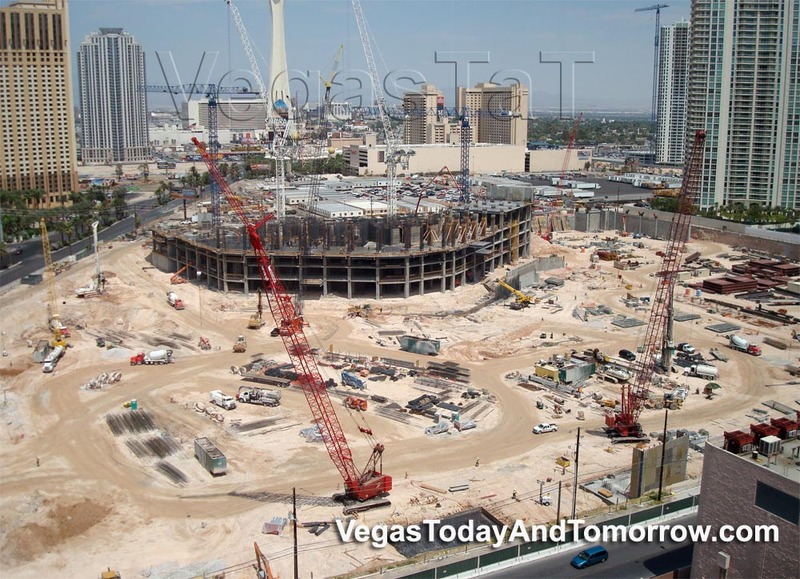 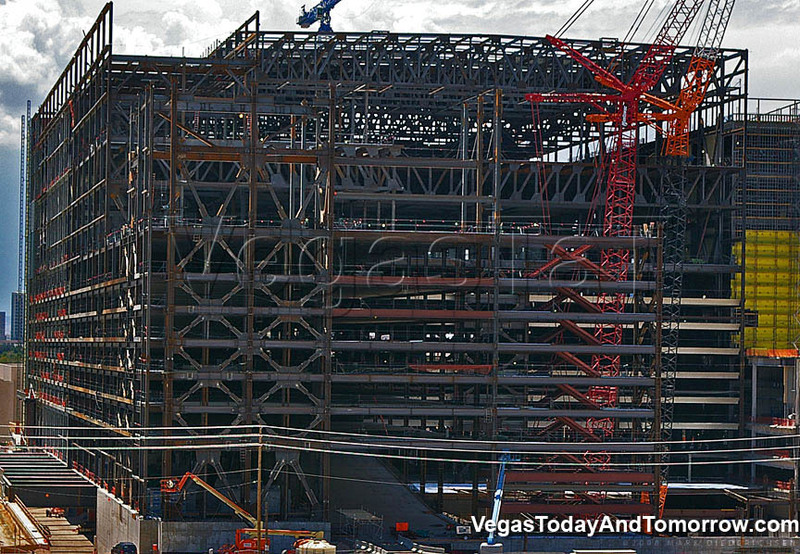 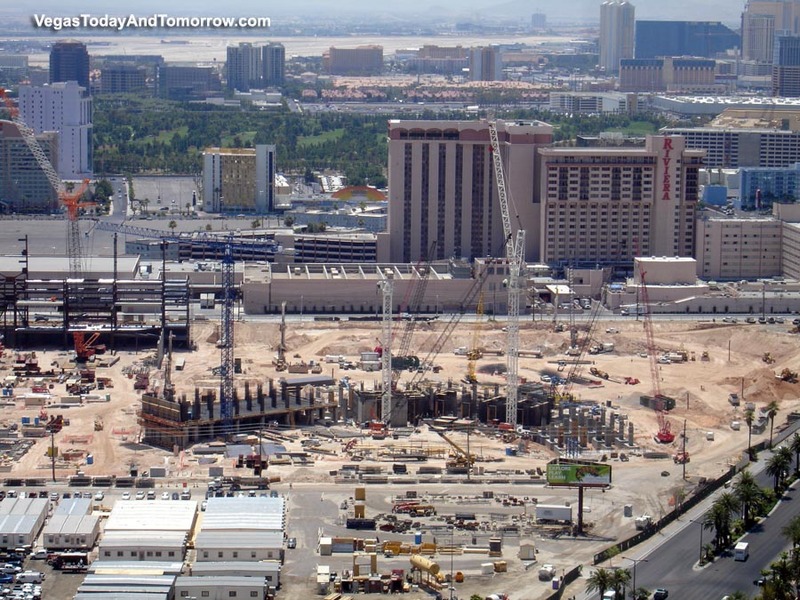 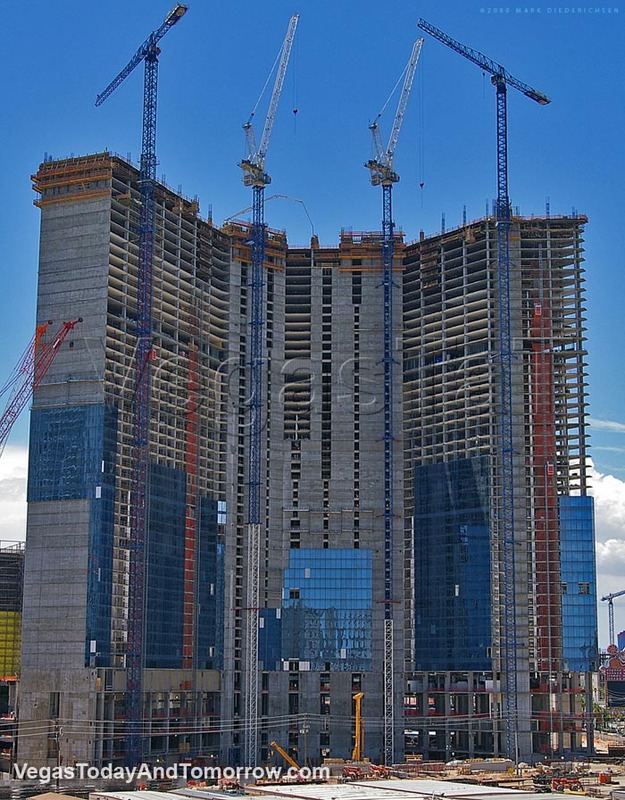 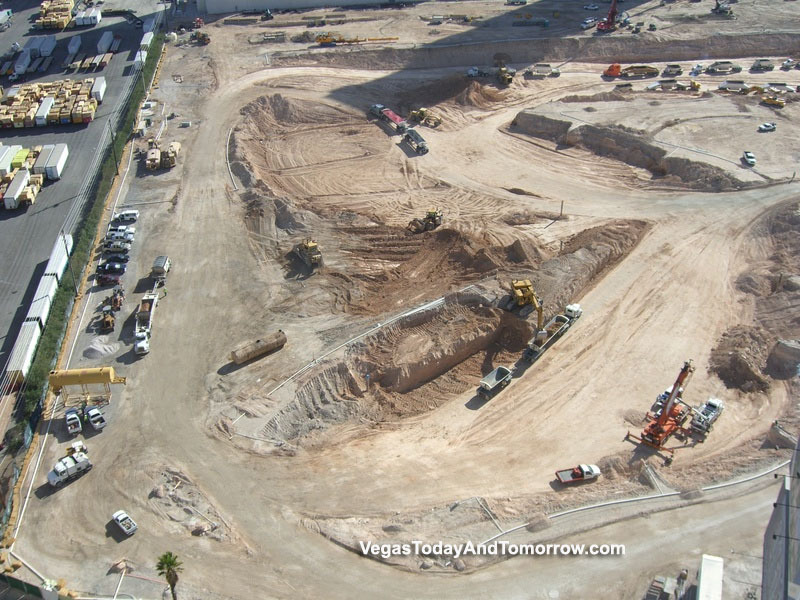 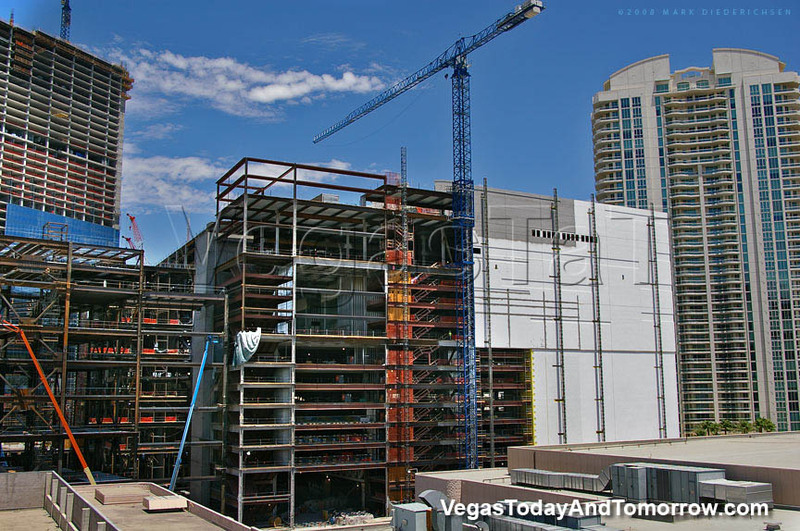 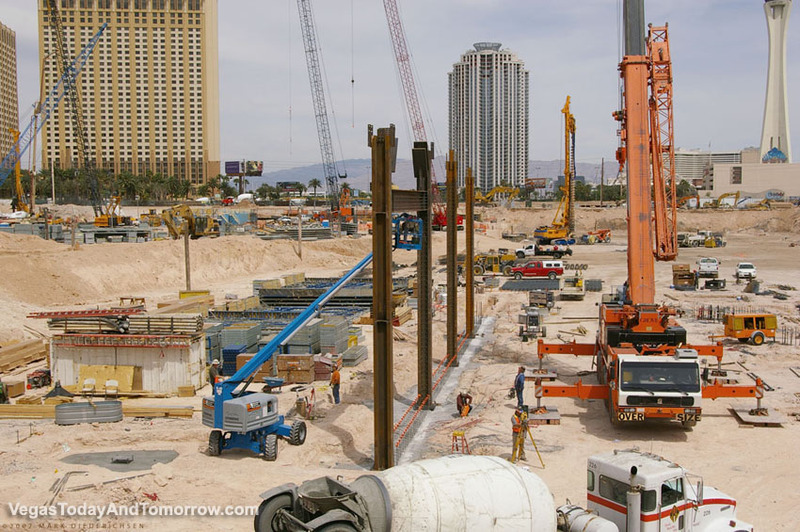 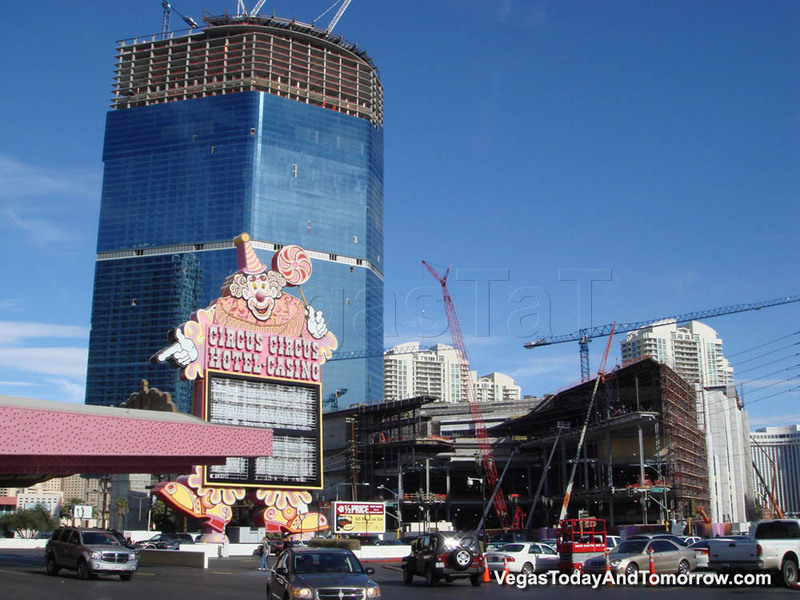 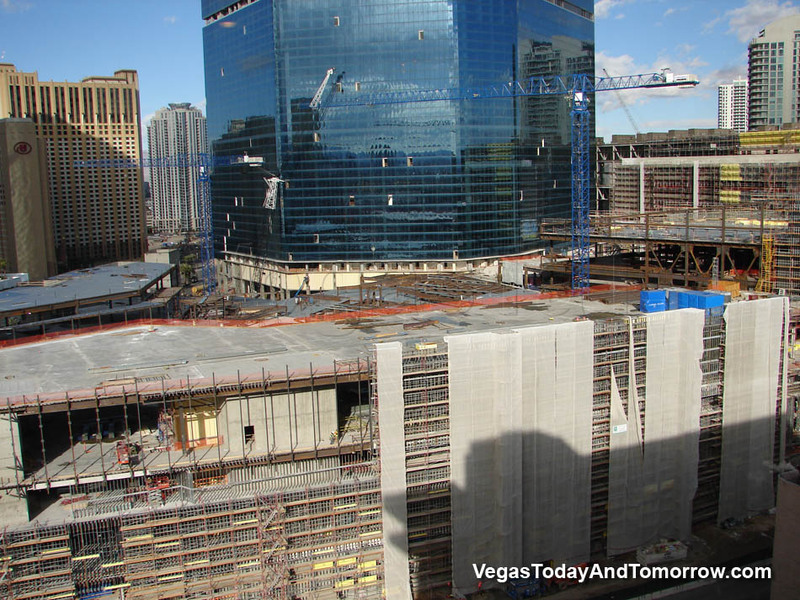 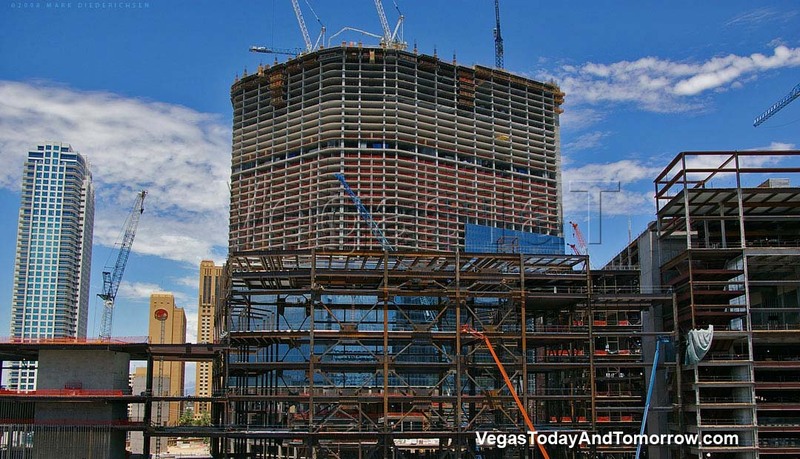 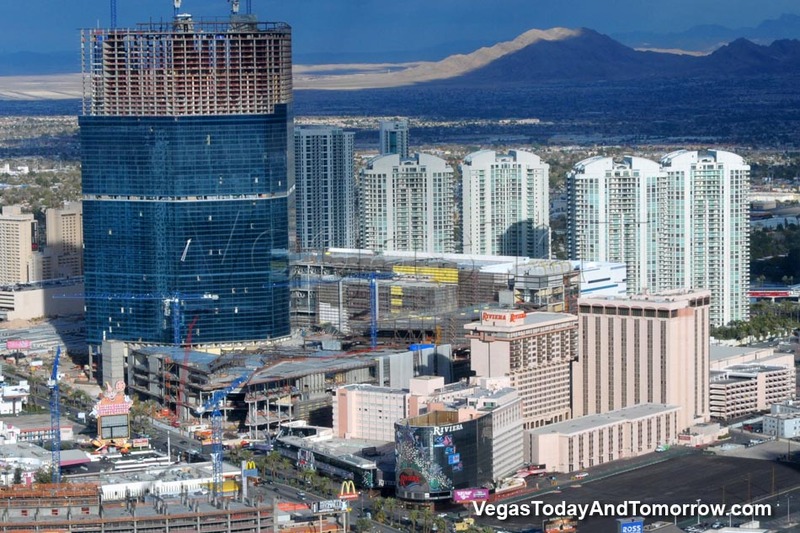 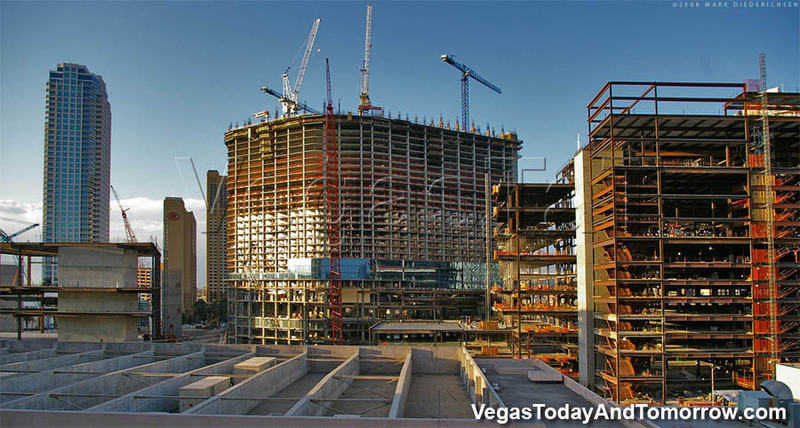 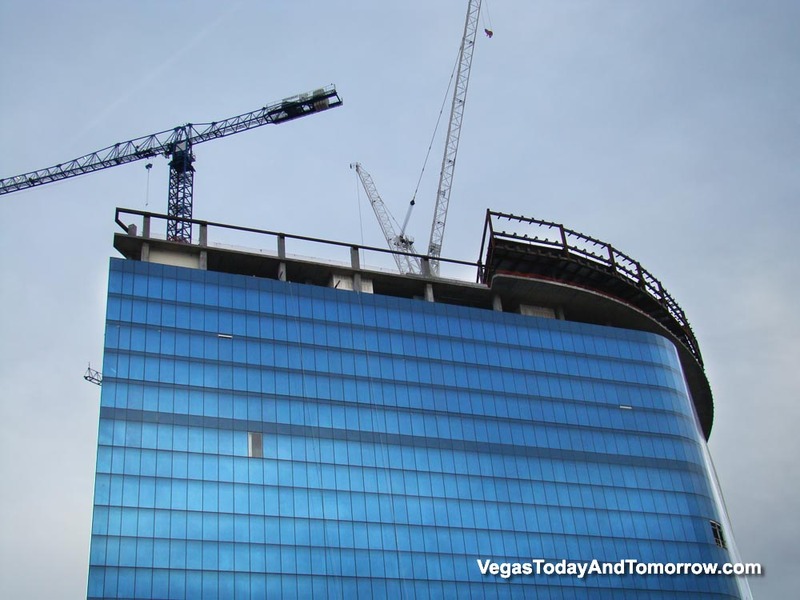 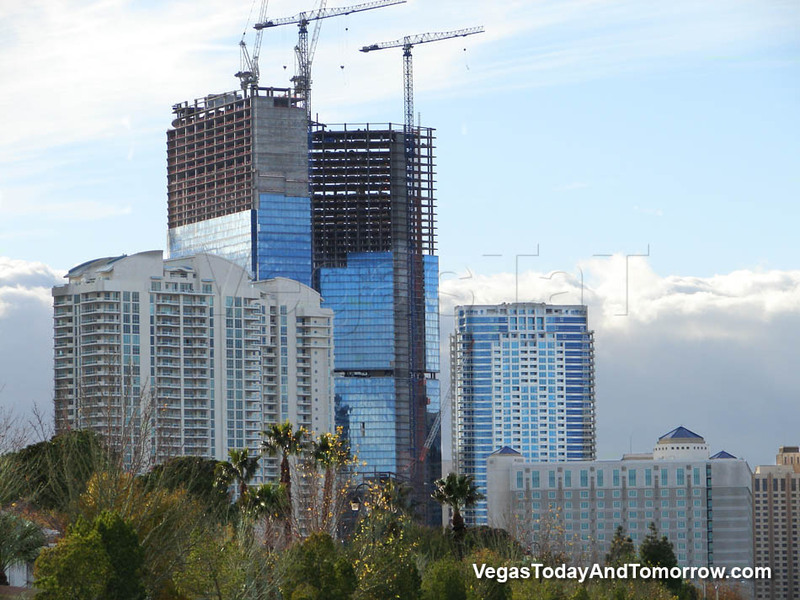 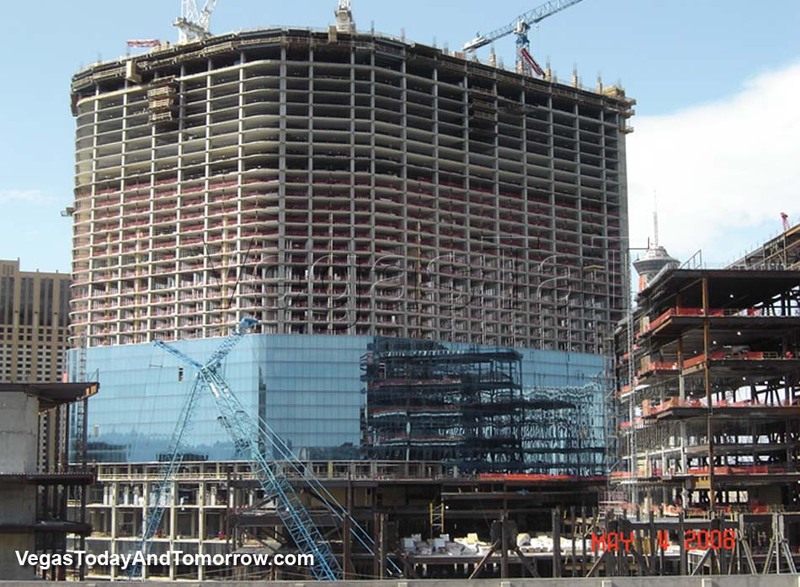 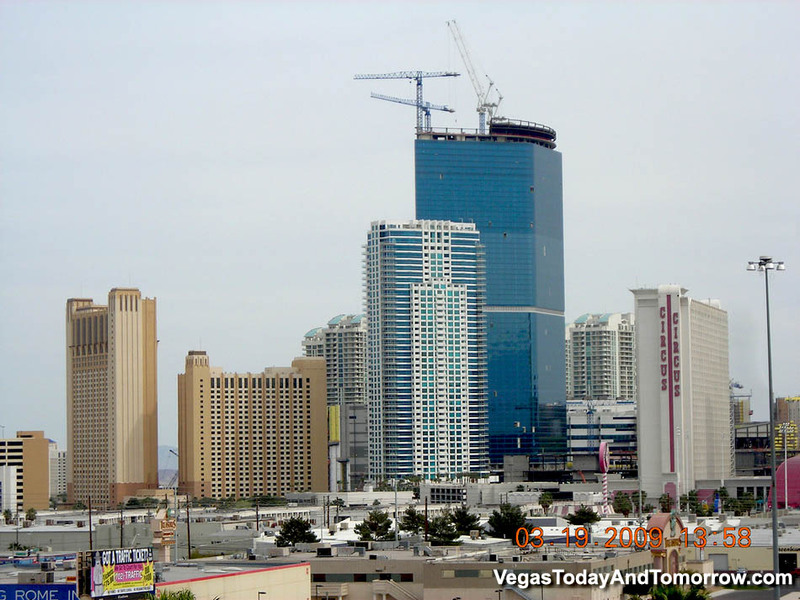 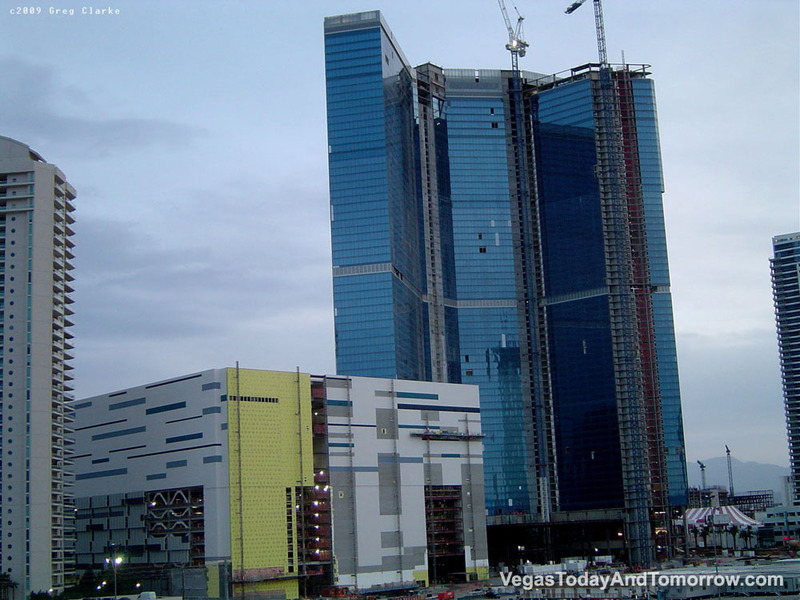 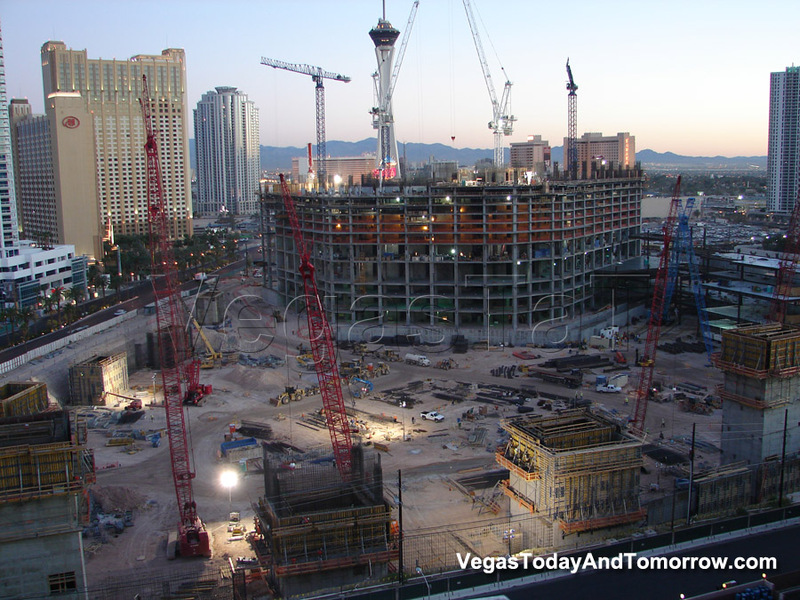 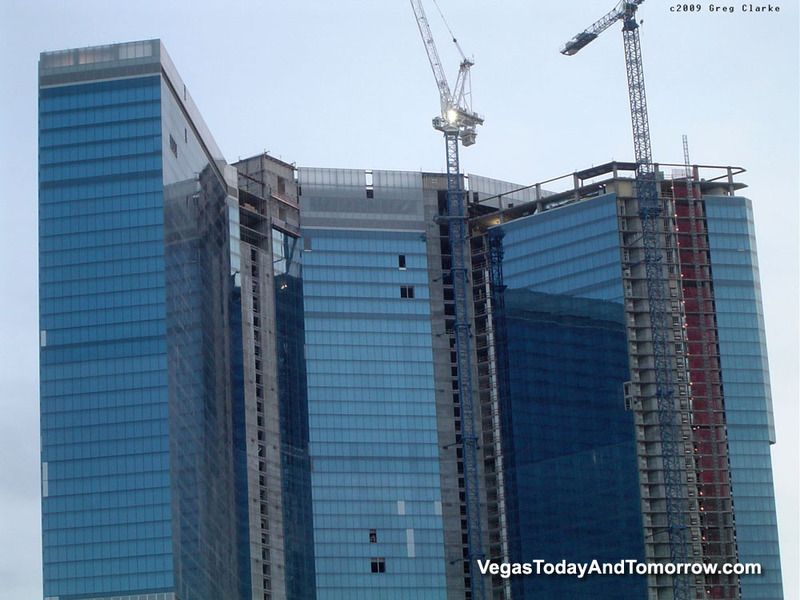 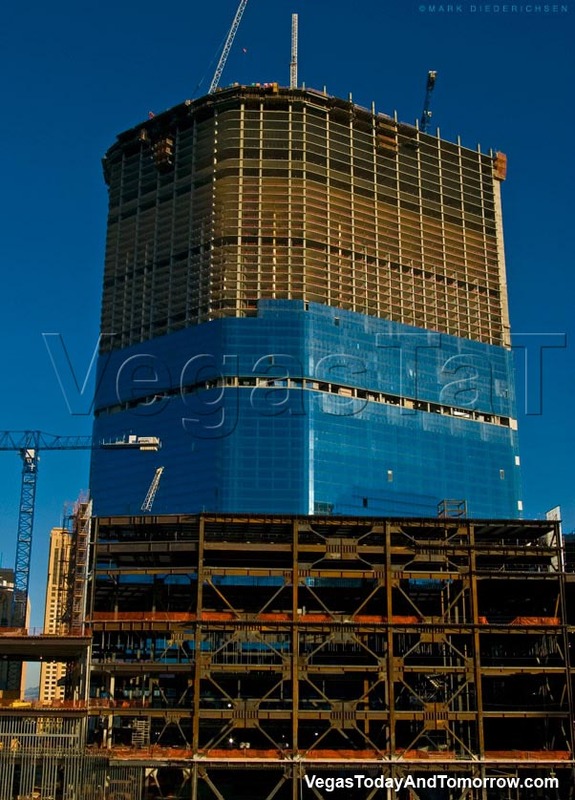 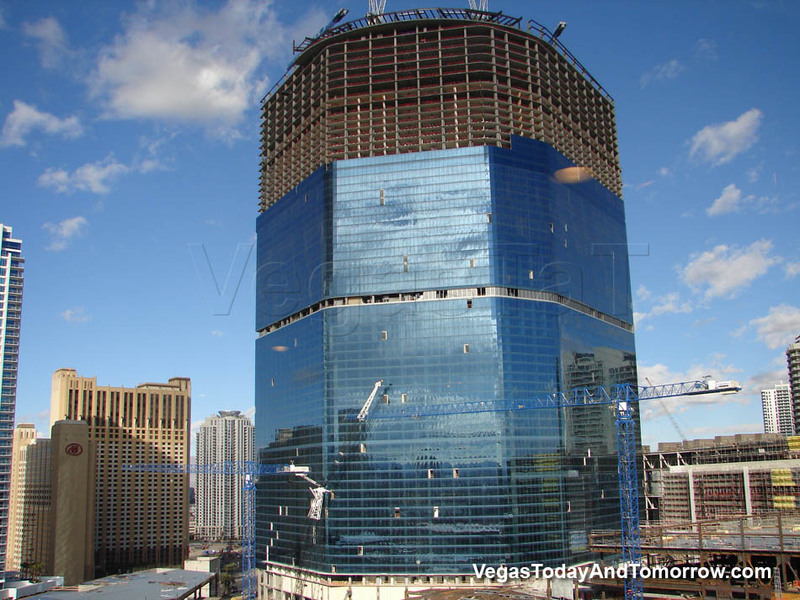 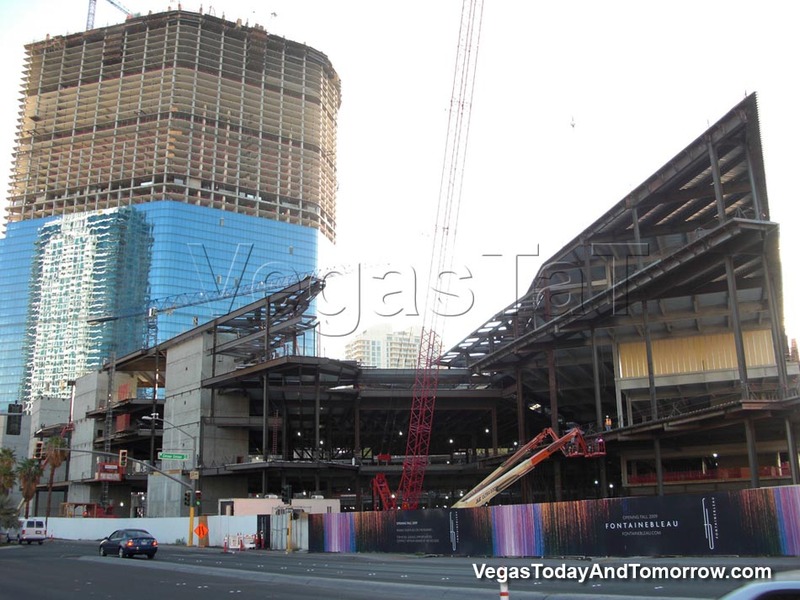 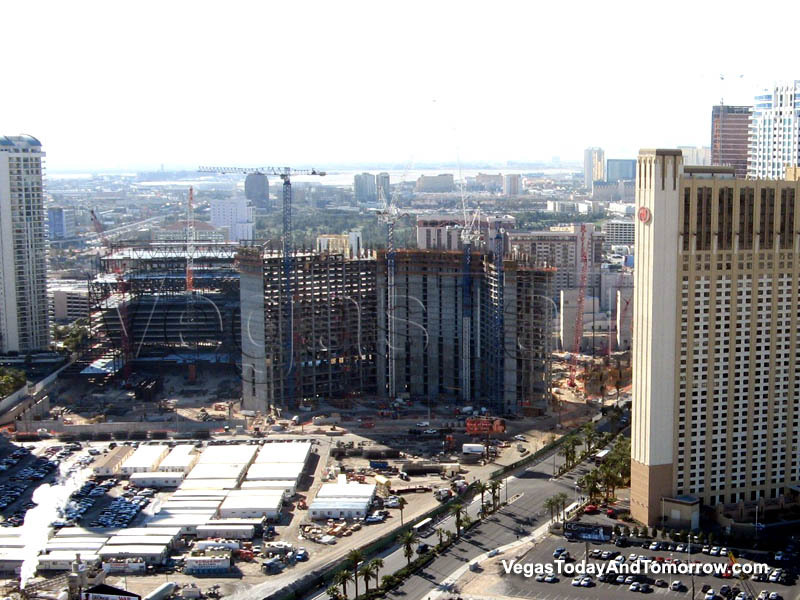 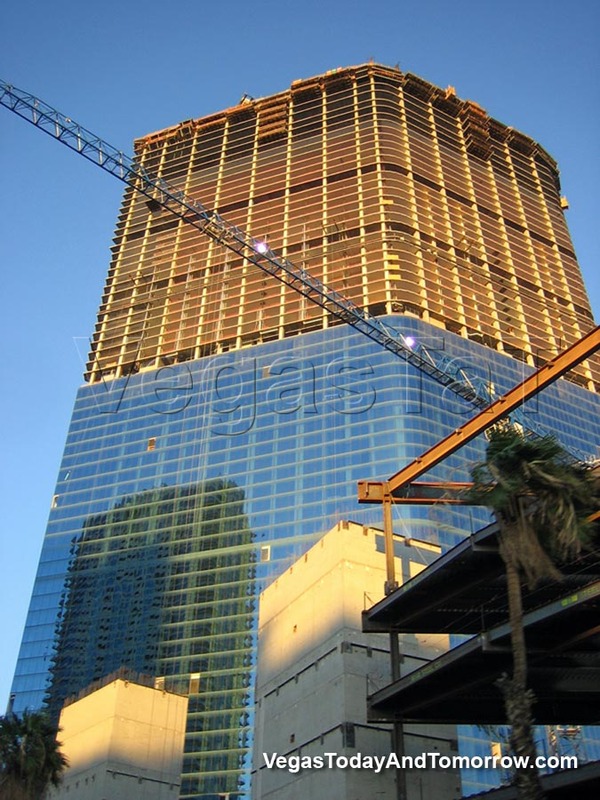 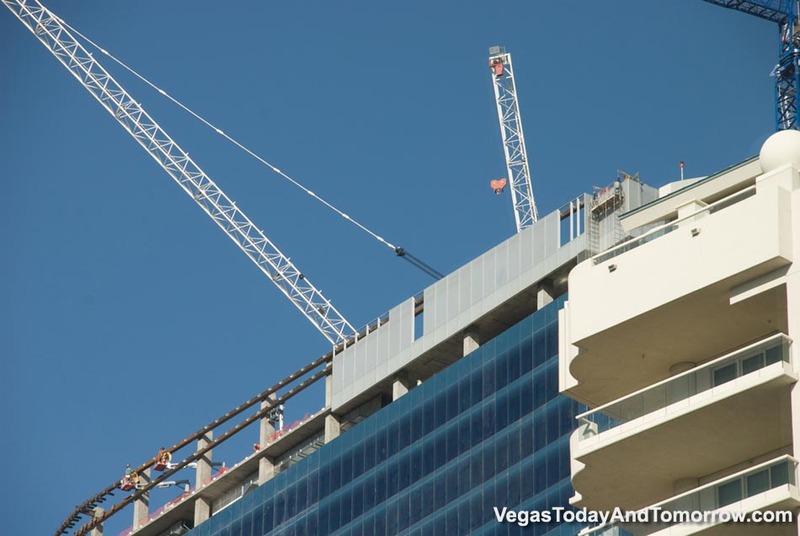 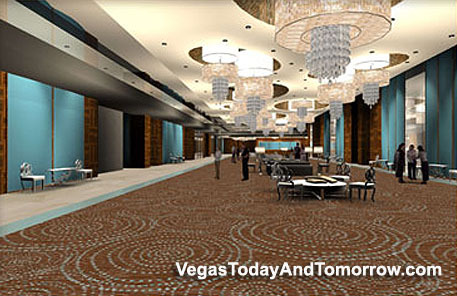 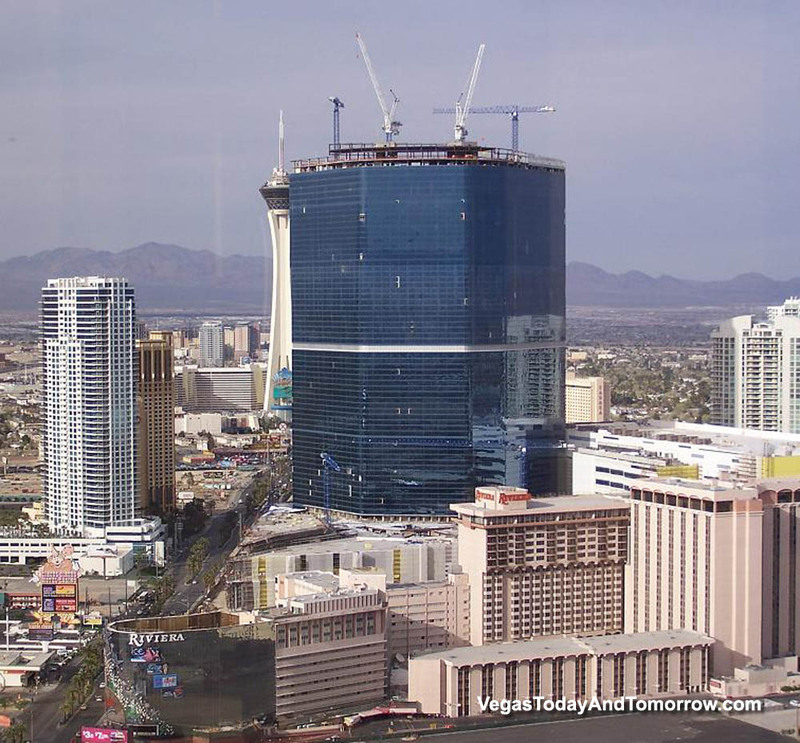 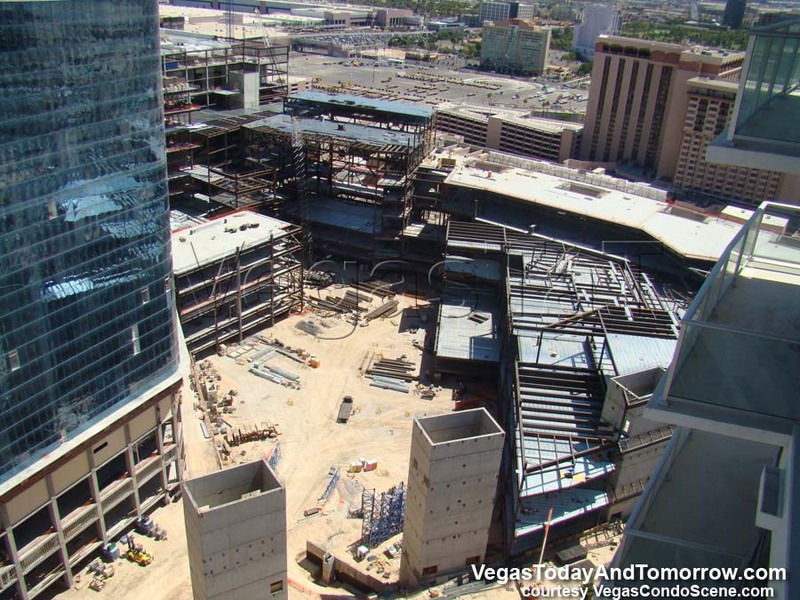 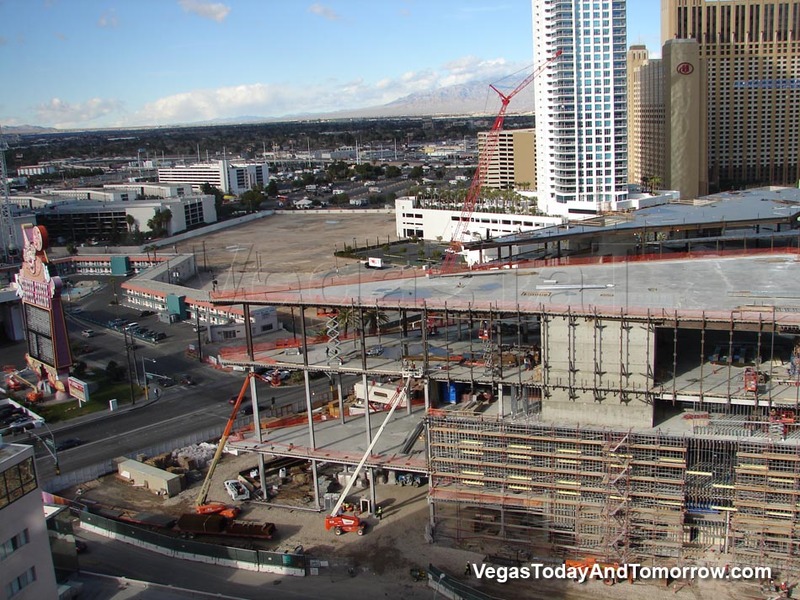 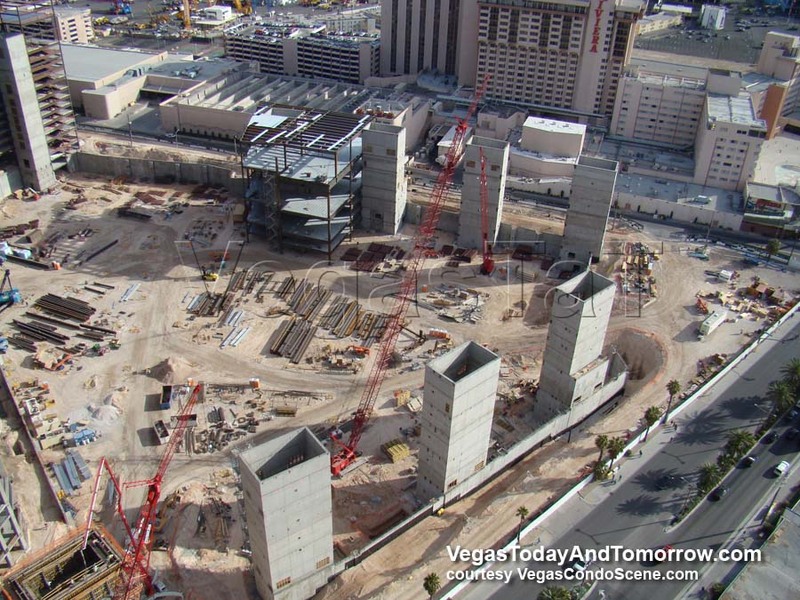 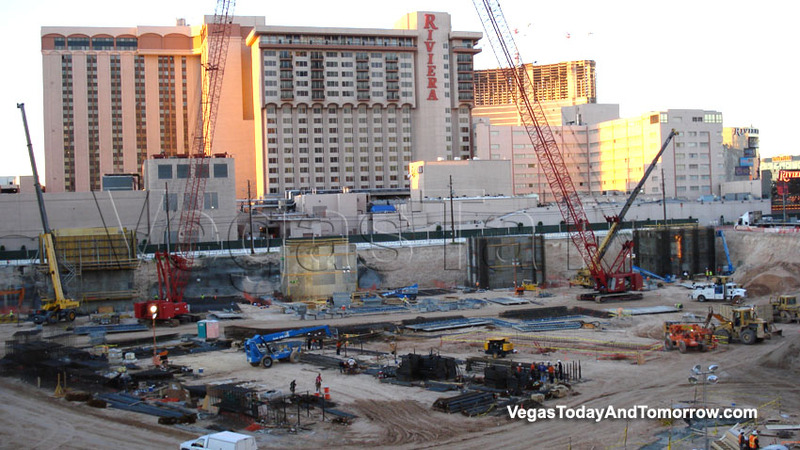 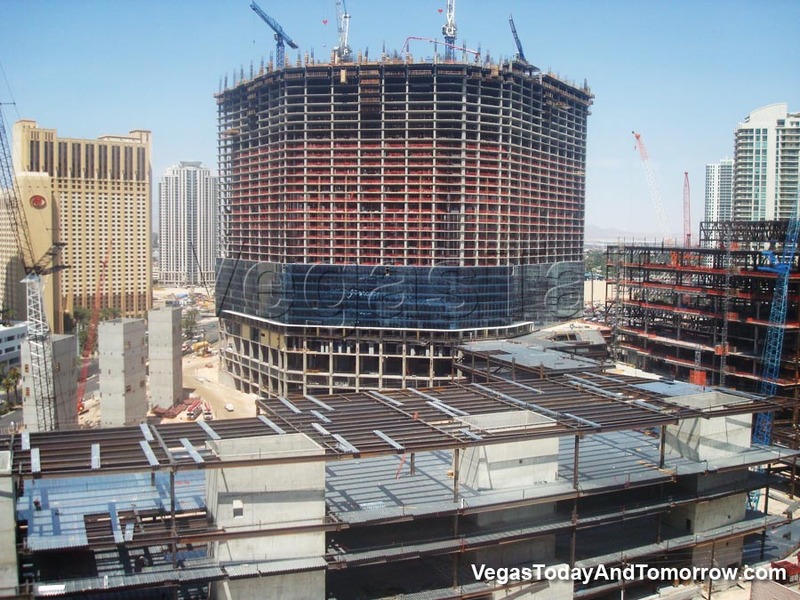 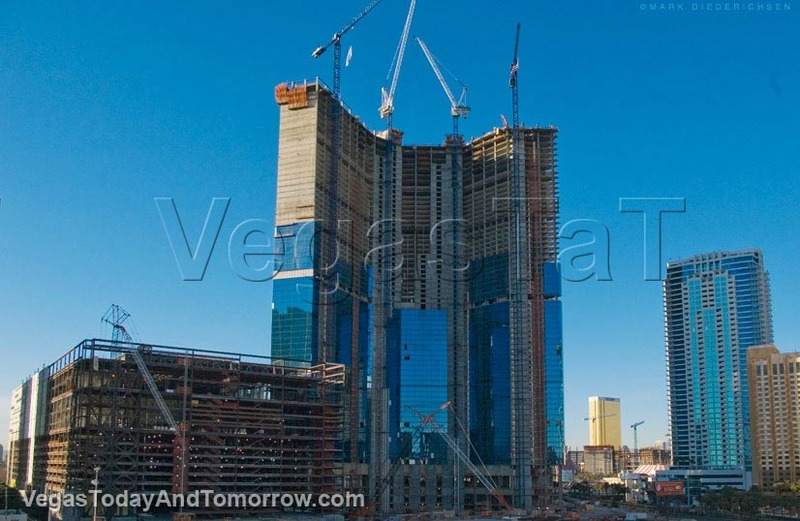 shows progress at the Fontainebleau Las Vegas site. 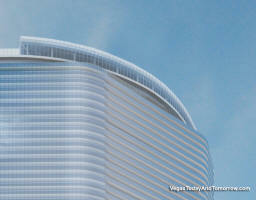 tower up to the third floor. 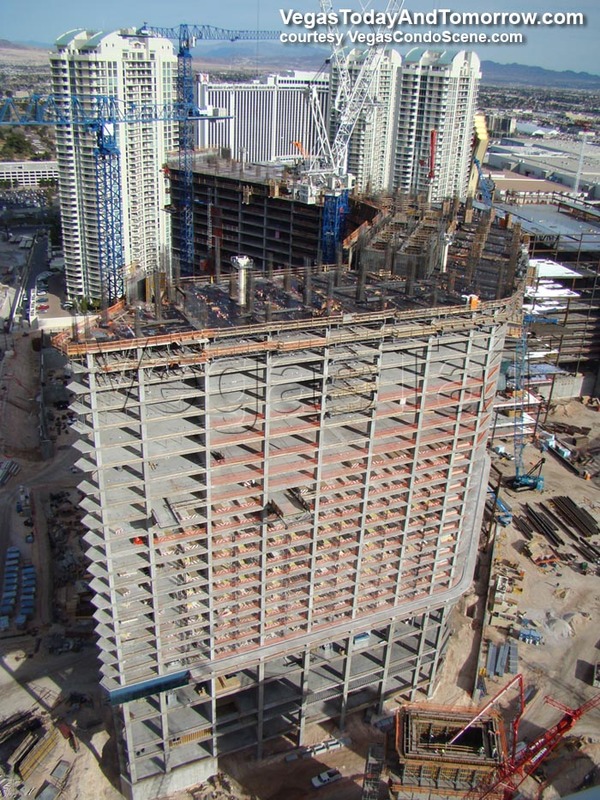 Photo shows the south side of the project. 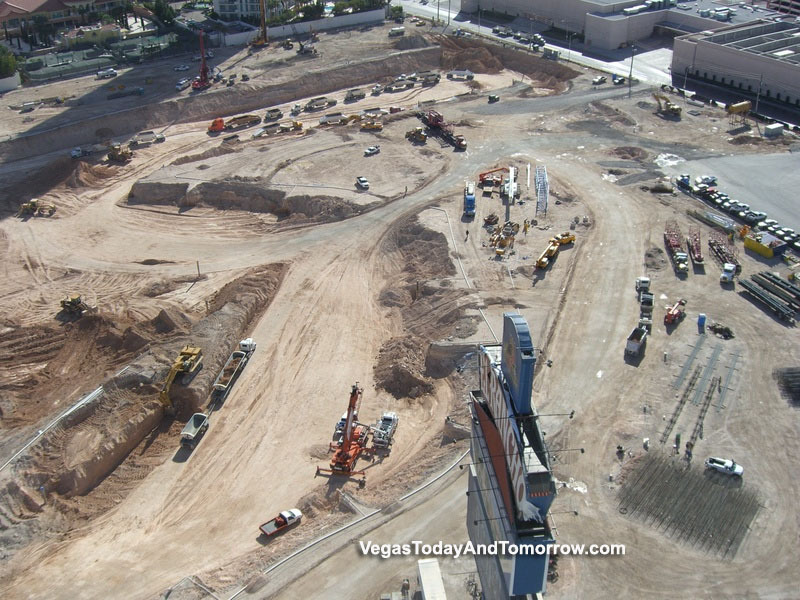 groundbreaking, this is certainly construction.